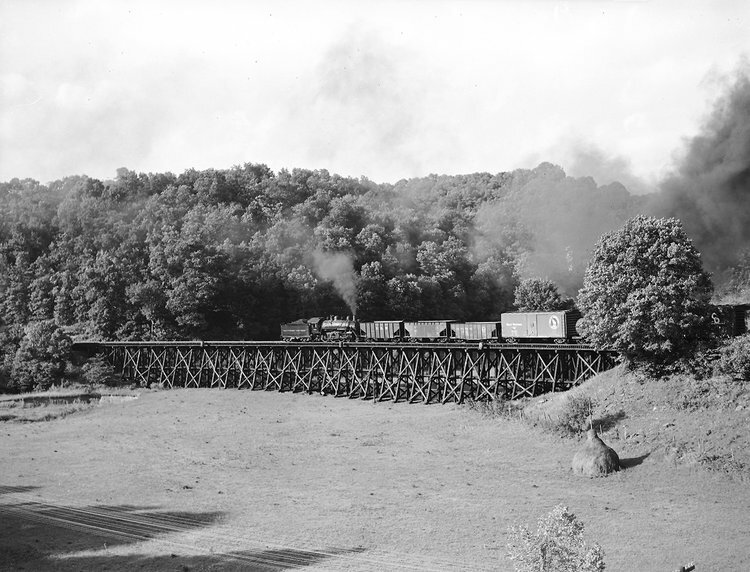 Train #457 runs across Barrs Trestle headed for Spencer, WV in this 1952 image. B&O Ten-Wheeler #2026 leads a coach and mixed manifest bound for the Roane County seat. Photo Richard J. Cook/courtesy Allen County Museum. All rights reserved. There were family ties to the RS&G but not on the scale of the other Jackson County railroads along the Ohio River and the branch to Ripley. My paternal grandfather rode the train to Spencer but his trips over the line had ended by the mid-1930s. By this time my father had accompanied him and in the course of time, both had rode the B&O Ripley and Spencer Branches in their entirety. 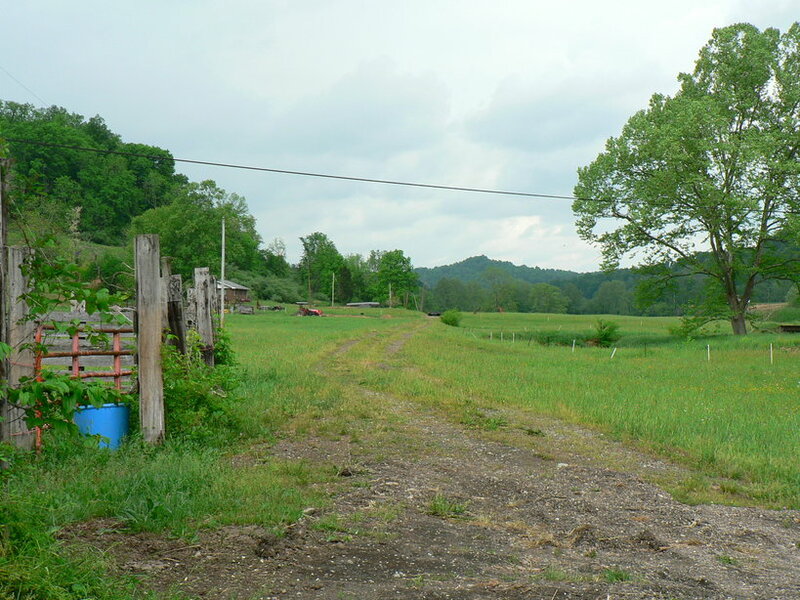 My father grew up along the Ripley line and his memories there more vivid. On the Spencer line, his recollections were of those as a passenger and of a lesser extent. Conveyed to me in my youth were his remembrances of the Sandyville area and the livestock market at Spencer. Many years later during the 1980s, we took a drive along Liverpool Road and he recalled the farms he saw from the train passing through this fertile land. This piece on the RS&G- B&O Spencer Branch is a literal companion to the previously published B&O-Millwood to Ripley feature. The similarities are great to the extent that both could be meshed into a seamless article. 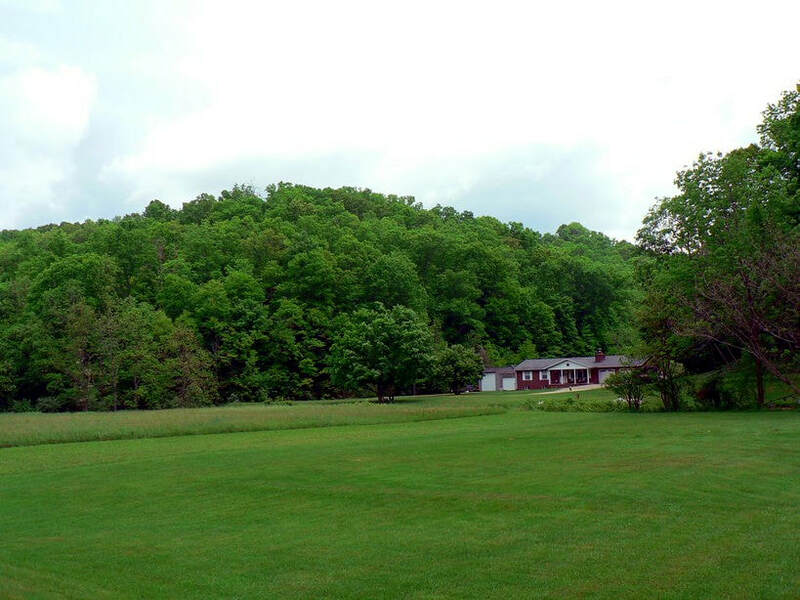 Built during the late 1800s, both traveled the quaint and pastoral creek basins of either Jackson and/or Roane counties interspersed with hilly terrain. They were interconnected operationally---the same crews and locomotives working both in a single day. Along the routes of both lines, small towns and villages were touched and served for many years lasting into the 1960s. Before the era of improved roads and increased numbers of automobiles, they were the lifeblood of commerce and travel for the rural communities serving as the pipeline to the outside world. Epitomizing an existence in an agrarian culture, the heyday of both existed when agriculture dominated the regional economies. 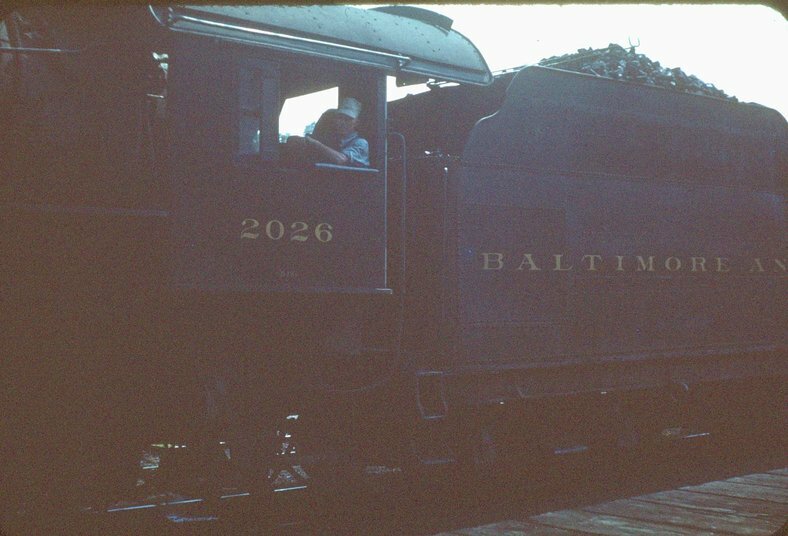 The charm that is the branch line railroad was embellished in both---it was here that a B&O Railroad more associated with such urban regions as Baltimore, Pittsburgh, and Cincinnati was humbled and successfully wore a small town face. In spite of the numerous similarities with both the Ripley and Spencer branches, there were differences. The RS&G was longer in mileage nearly tripling the length of the Ripley line. It could also be considered more dramatic with its high trestles spanning creek and ridge divides as it traversed the countryside of two counties. At its inception, it was envisioned as a larger railroad that was never realized with a proposed terminus deeper into the heart land of West Virginia at Glenville. Finally, for the student of history, the RS&G was recorded more so than the Ripley line and especially through the camera lens. 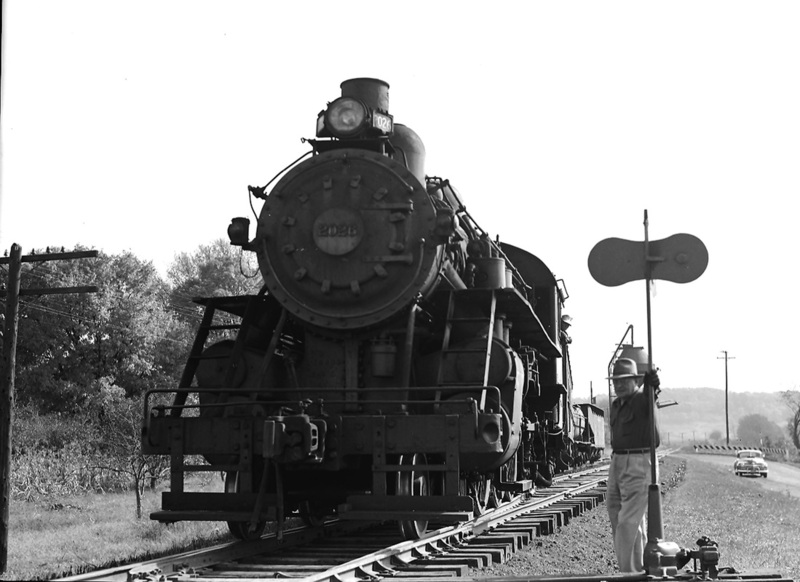 Every railroad past or present projects a defining element to its character. Whether it is the topography, regional industry, or man- made characteristics, the route will be stamped with an identity. 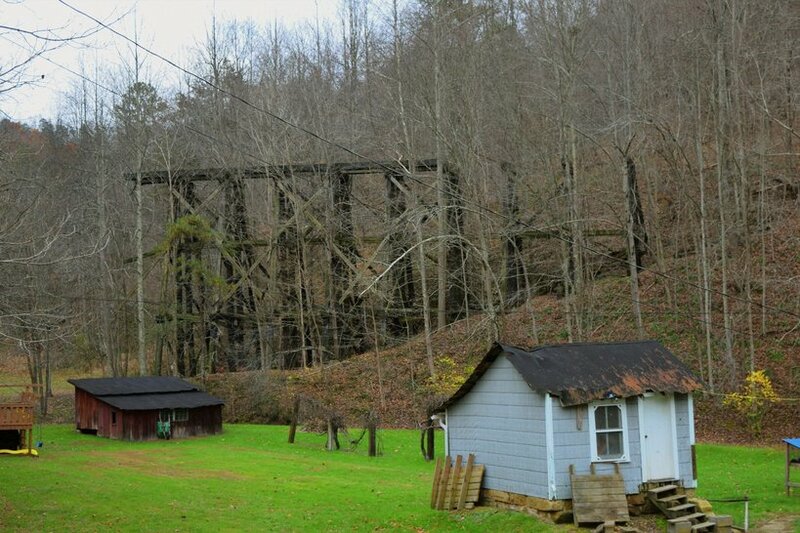 There is no question as to what the hallmark of the RS&G was---the trestle. Within the nearly 33 mile length--divided equally between Jackson and Roane--- there were no less than 69 spans ranging from step stools across small brooks to the high trestles that adorned the divide at Sandy Summit. That averages to two spans of any given type per mile with the greatest concentration between Sandyville and Liverpool. 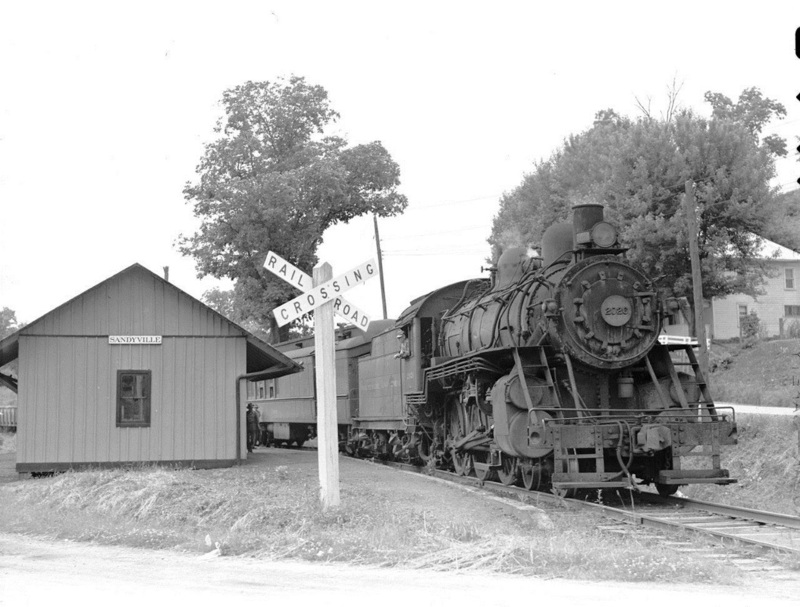 The Spencer Branch, like its companion branch to Ripley, defied the hands of time longer than similar railroads across the country. The fact that both of these lines survived into the 1960s is a reflection of the territory regarding the development of direct and expedient highway access to the communities. Once this did occur, the lines faced obsolescence. There were no more passengers and the few shippers served by both either closed shop or switched to trucking. Simply speaking, there was no longer any justification for their existence and especially in the case of the Spencer Branch. By its sheer nature, an expensive piece of railroad to maintain with the multitude of bridges and trestles. In the end, they were done without a feasible reason for existence. But both once fulfilled a need for over 75 years until progress and technology supplanted them. B&O historians or even the regional observer with a curiosity of how the area looked in an earlier time can be grateful for the photographic pursuit and talent of the late Richard J. Cook. If it were not for his photographs taken on both the Ripley and Spencer Branches of the B&O, even fewer images of trains on these rural railroads would exist. Ironically, Mr. Cook was not documenting these branches themselves but the locomotives that operated on them during the twilight of steam in the early 1950s. The steam locomotives in all of his photographs are either B&O class B-8 and B18 4-6-0 Ten Wheelers--- the Ripley and Spencer Branches along with the Ohio River line were the last bastion of their operating existence. In essence, Mr. Cook succeeded on two counts. Not only did he satisfy his quest to record these locomotives but left for posterity images from two mostly forgotten but charismatic B&O branches. The images from the Spencer Branch are more numerous than those on the Ripley line for two reasons---it was greater in length with accessible photo locales and presented Mr. Cook with high trestles as a photographic setting. During May 2015, I revisited the area to take photos as a supplement not only for the archival images but also to document how the region looks today. In addition, there are images taken along Liverpool Road from 2005 that contrast with the recent ones. The visit to the Roane County area between Reedy and Spencer was the first time I had been to that area in almost 30 years. My initial plan was to make the trip in March--the optimum time to trace abandoned railroads because of no foliage---but events dictated otherwise. Although I managed several satisfactory photos for comparison, growth had obscured others I had sought. There are also areas such as Seaman/Dukes and Reedy south to Spencer that are not covered as in depth as I wish. Perhaps another visit during cold weather months will yield better results. On April 10, 1886, West Virginia Secretary of State Henry S. Walker signed into incorporation the chartering of the Ravenswood, Spencer, and Glenville Railway. 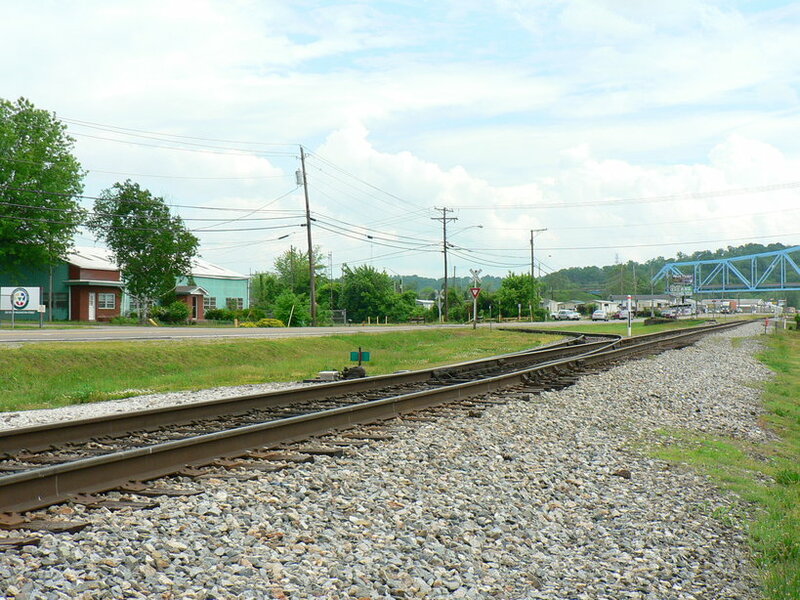 This railroad by intent, was to connect with the Ohio River Railroad at Ravenswood then proceed east across Jackson County henceforth entering Roane County to the town of Spencer. 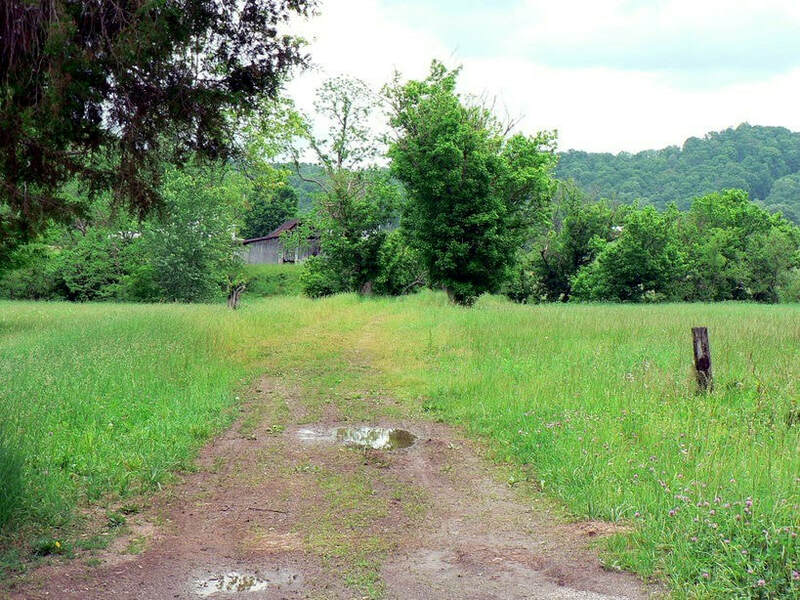 From this terminal, the road would proceed—on a yet undetermined route---into Calhoun County and continue into Gilmer County to the town of Glenville. The charter also called for an extension to Weston in Lewis County. 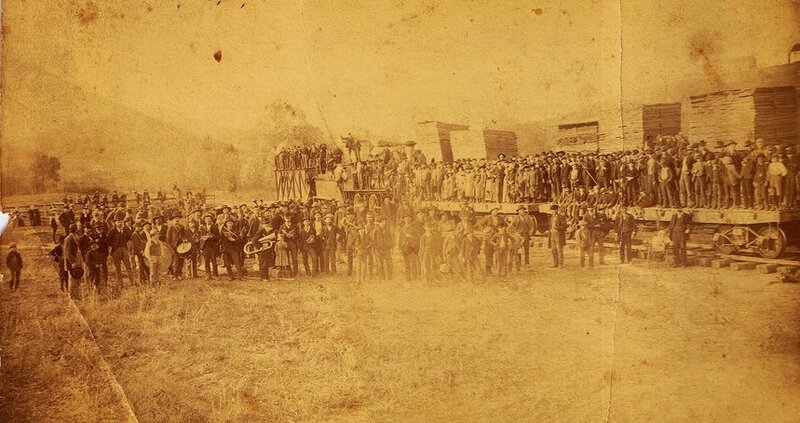 Thirty-one individuals and two small companies were the visionary force behind the construction of the railroad. Of note, all but one was from either Ravenswood or Spencer. Initial capital for the new railroad was $100,000 with the aforementioned individuals as stockholders. Construction of the road commenced within a few years and by 1892, the line was intact from Ravenswood to Spencer. Construction stalled at Spencer but worthwhile of mention is that hope still prevailed into the early 1900s that the line would expand to the targeted destinations of Glenville and Weston. Lack of finances to fund the construction and a change of ownership, however, were to thwart this extension and Spencer became the eastern terminus by default. The year 1912 was a watershed year for B&O for expansion by means of acquisition. 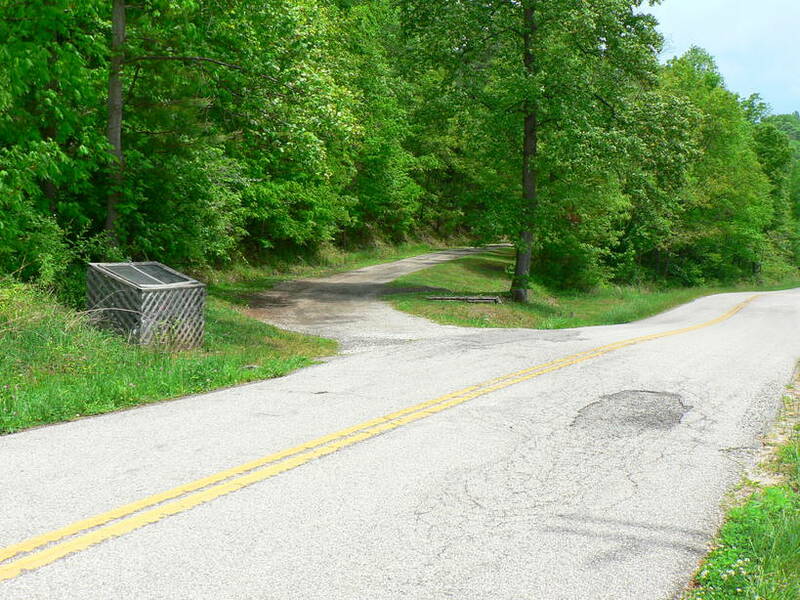 A number of small independent roads in north central West Virginia were absorbed and among them the RS&G and the Ripley and Mill Creek Valley Railroad. 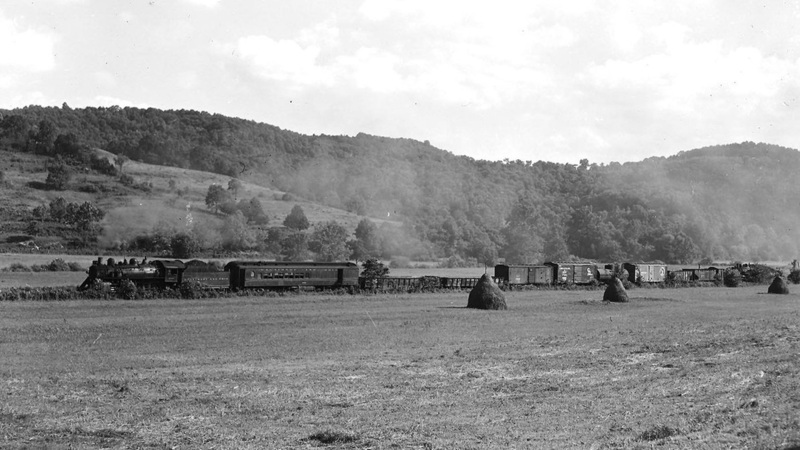 Another line of note was the takeover of the West Virginia and Pittsburgh Railroad that extended south from Clarksburg to Weston, Sutton, and Richwood. Since B&O now served this territory via acquisition, the extension of the RS&G from Spencer to Glenville and Weston was doomed. 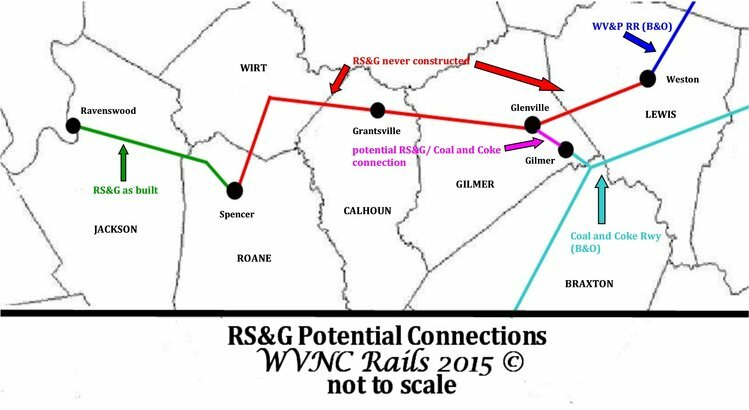 Only the region between, namely Calhoun County and western Gilmer County, would never realize the construction of a railroad. Conversely, the B&O acquisition of the RS&G and the R&MCV Railroad---the branch to Ripley---would intertwine the operational existence of both until their abandonment in the 1960s. A 1952 passenger timetable for the B&O Spencer Branch. There is an operational variance on this schedule as to the stops. Between Ravenswood and Spencer, all of the railroad timetable stops are flags with Train 457. In contrast, returning Train 458 had scheduled stops at Reedy, Liverpool, and Sandyville. 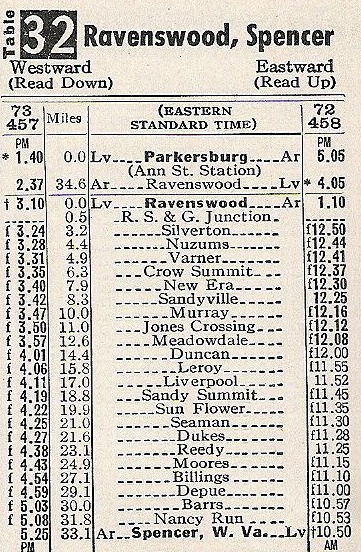 Parkersburg along the Ohio River line is interconnected on this timetable with Trains 72 and 73 at Ravenswood. Timetable excerpt courtesy David Somner. Optimism flourished with the completion of the railroad to Spencer and the timing could not have been better. In a region basically landlocked without good roads even before the dawn of the automobile, the passenger business was steady. Goods arrived to from Roane and neighboring Calhoun County that accelerated business growth in the area. Within a decade, central West Virginia was in the midst of a great oil and gas boom that mutually benefitted it and the RS&G. This growth peaked during the World War I era and it was during the 1920s that adverse change gradually emerged on the scene in the form of the automobile. The inevitable decline in passenger ridership was forthcoming but forestalled due to poor roads and the Great Depression. The impact of changes truly became apparent by the outbreak of World War II. The history of the RS&G prior to World War II is obscure primarily because documentation of the line is scant. Little recorded history exists whether in print or photograph. Railroad timetables provide the only snapshots in regards to rules and operating practices. During the war years, B&O operated daily trains #67 and #68 which as common procedure were mixed. 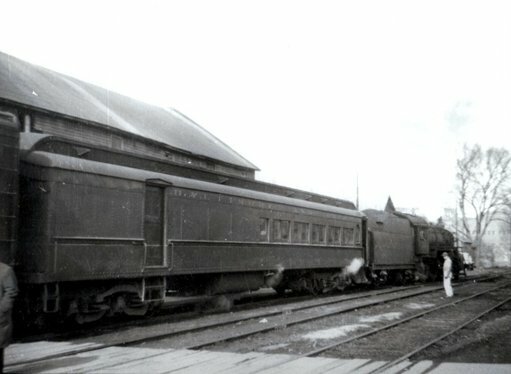 Consisting of a coach and manifest, these trains served in dual service for passengers and freight between Ravenswood and Spencer. During the war years, a second coach was added on occasion in proximity to major holidays and also of effect, wartime fuel rationing. By the end of the 1940s, the war time effect on the railroad had subsided and it entered the final phase of its existence with the continued decline in passenger ridership. Improving roads and the increase in automobiles sealed the fate of a vanishing passenger base. A significant change occurred at the end of the decade which impacted operations and introduced a brief period of photographic documentation. 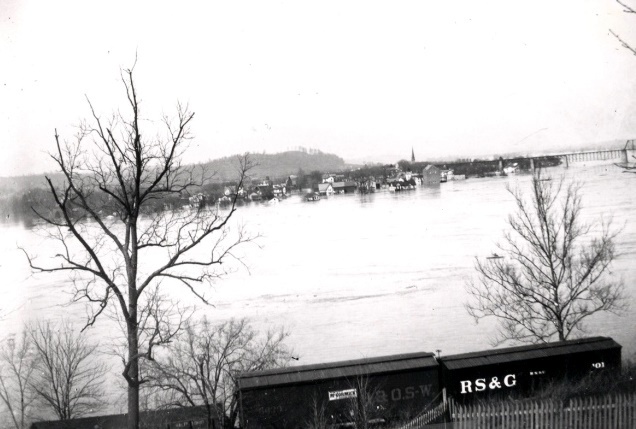 Until 1947, the size and weight of locomotives on the Ohio River line was restricted between Parkersburg and Kenova due to the obsolete bridge that spanned the Kanawha River at Point Pleasant. 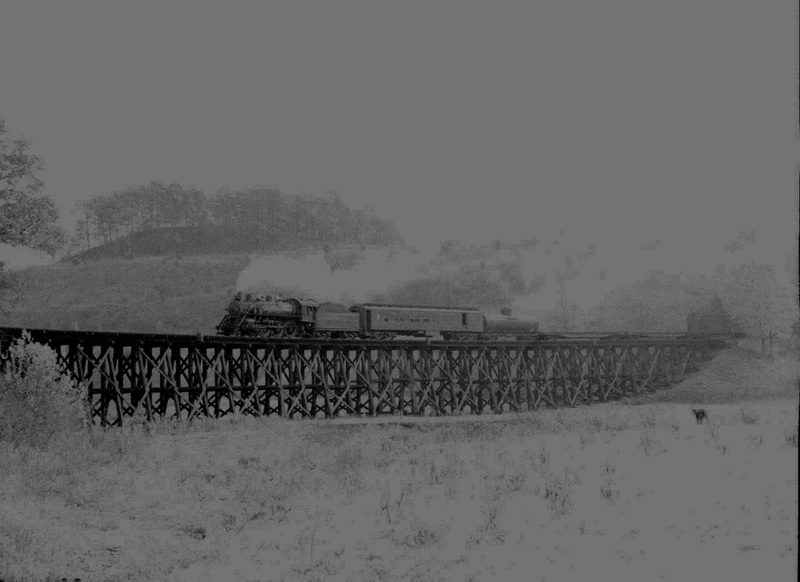 Once the new truss bridge was constructed, larger power such as 4-6-2 Pacifics and 2-8-2 Mikados appeared on the route which exiled the remaining 4-6-0 Ten Wheelers to the Ripley and Spencer branches. It was this action that captured the interest of Richard J. Cook who over the course of the next three years, photographed these remaining Ten Wheelers on the Ripley and Spencer branches. During the 1950s, B&O changed the symbols of the trains on the RS&G to #457 and #458, respectively. Trains continued to operate daily except for Sunday and until the end of the decade, included a single coach for the occasional passengers. Integration with the Ripley branch was well documented during this era as the same crew and locomotives operated on both branches. Train #458 departed Spencer during the morning to Ravenswood where it then ran extra on the Ohio River to Millwood. Here it became Train #961 to Ripley and spent a half hour switching cars and turning the locomotive. Departing Ripley as Train #962, it ran extra to Ravenswood and became Train #457 to Spencer and terminated. The schedule was repeated again the following morning. 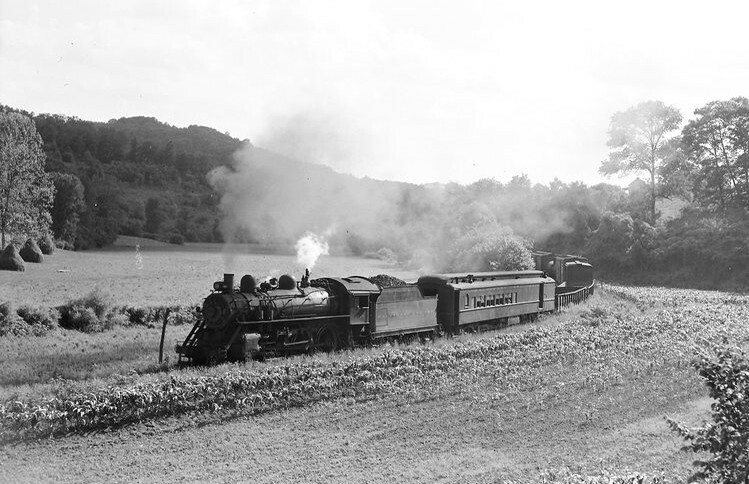 In 1953, further winds of change signaled the end of steam on the Ripley and Spencer routes. The last date for steam on the line was December 16---the following day, a single Baldwin VO-1000 diesel replaced the Ten- Wheelers for use on both branches. The following year due to economic reasons and in an effort to reduce costs, B&O announced that Trains #457 and #458 would continue operation six days per week but the layover in Spencer eliminated. Train #457 would depart Ravenswood in the morning and return as #458 from Spencer that afternoon. 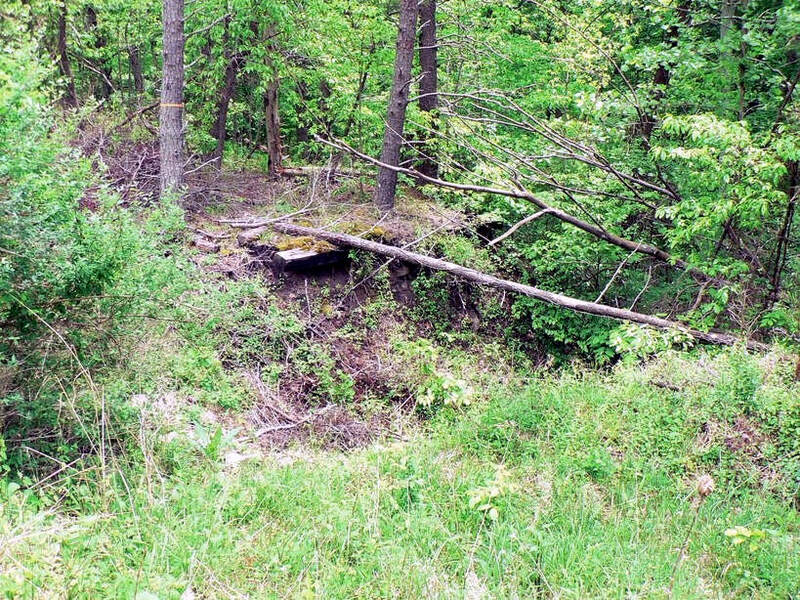 Railroad abandonments are generally controversial and the Spencer Branch was no exception. This 1964 newspaper clip from the Charleston Daily Mail criticizes B&O for filing with the ICC despite the proposed construction of a paper mill near Spencer. B&O obviously deemed the new business not worthwhile versus the cost of keeping the line open. The 1960s was the sunset for both the RS&G and the Ripley branches. Service ended on the Ripley line in 1963 and by this date, scheduled trains no longer appeared on the timetable for Spencer. Freight only movements operated as extra runs as needed. The early 1960s also witnessed three special excursions as final passenger runs to Spencer as a last opportunity to travel the line since the inevitable loomed on the horizon. By 1964, the condition of the line was a concern primarily regarding the bridges and trestles. With the passing years, locomotives and freight cars increased in size and weight and this combined with deteriorating structures led to an embargo placed on the line and subsequent filing for abandonment. The cost of maintenance versus the small revenue the line generated did not justify the expense of upgrade. 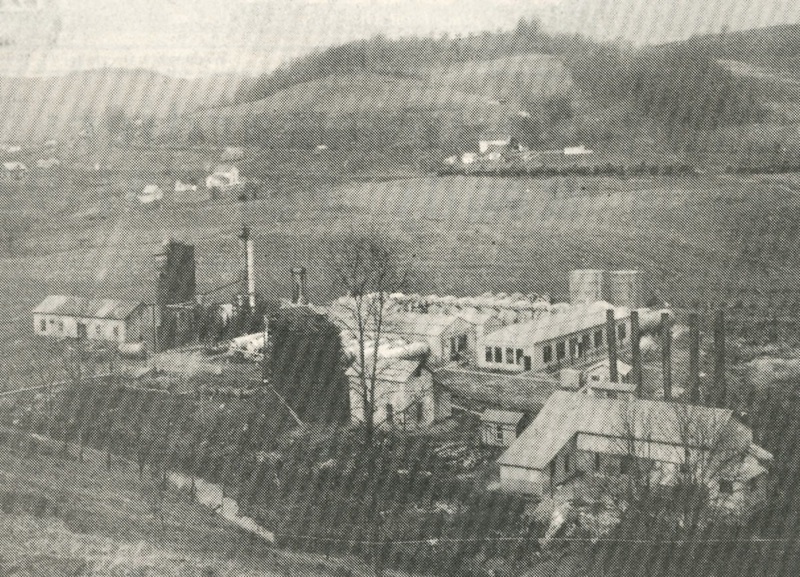 During 1964, the West Virginia Pulp and Paper Company expressed interest in building a plant near Spencer but this did not thwart abandonment of the line. In 1968, B&O removed the no longer used track forever ending rail service to Spencer . The "Rub, Snuff & Grin" became only a memory. The profile of the railroad at selected points was as follows with respect to elevation above sea level: Ravenswood (607) Crow Summit (755) Duncan (630) Liverpool (669) Sandy Summit (778) Reedy (679) Barrs (950) Spencer (748). These numbers reflect the up and down profile of the line between Ravenswood and Spencer. Three stiff grades faced trains in either direction--- Crow Summit, Sandy Summit, and Barrs .The grades at Crow Summit and Barrs were greater ascents but also longer. Sandy Summit was the stiffest grade and especially on its east slope. Trains were not required to display rear end protection whether it be by flag or caboose. Only a single train operated on the route which deemed the protection unnecessary. Undoubtedly in the history of the line, a second train existed at least once whether an extra or a work train. In this case, it typically would follow the scheduled train. The line was dark (unsignaled), operated by authority, with short sidings at the following locations still in service as of 1942: Crow Summit, Meadowdale, Liverpool, Sandy Summit, Dukes,Reedy, Billings, and Barrs. By the 1960s, the sidings at Meadowdale, Liverpool, and Reedy were gone with those remaining of little use at this date. A 1928 MyTopo map of the Ravenswood area along the Ohio River. 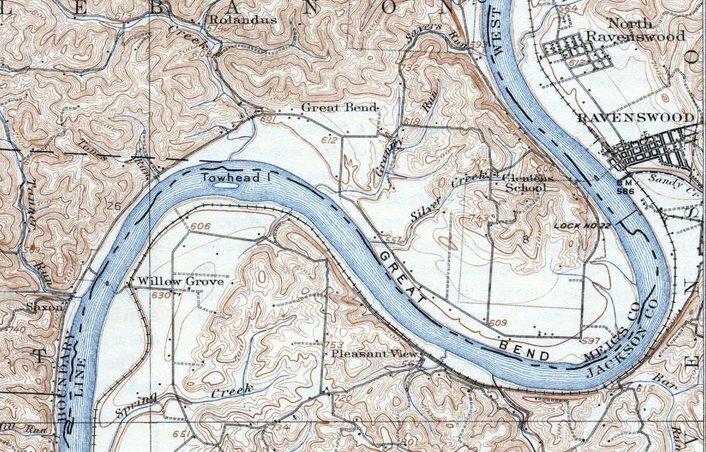 The RS&G connected with the Ohio River line south of the mouth of Sandy Creek on a wye. Operationally, the Ohio River line between Ravenswood and Millwood was the bridge connecting the running of trains between the Spencer and Ripley Branches. Ravenswood, a small town on land George Washington did not sleep but owned, has foremost been a river town along the bank of the “beautiful blue Ohio”. The coming of the Ohio River Railroad in 1886 and as the primary focus of this page, the Ravenswood, Spencer and Glenville Railroad completed in 1892, left an indelible stamp on the community development and history. Its railroad heritage, although with its zenith now in the rear view mirror, is still reflected in the passage of CSX trains along the Ohio River. As these trains move through town, the wheels roll over a spur connection to the Hartley Oil Company that appears to be simply that. An astute observer will notice piers standing in Sandy Creek beyond the Hartley Oil Company that suggests there was once more. Indeed there was. Turn the clock back to 1951 and this was a frequent scene at RS&G Junction in Ravenswood. B&O 4-6-0 #2026 is moving from the north leg of the wye on to the Ohio River line with Train #458. The freight cars returning from the Spencer line will be taken to a siding near the Ravenswood depot. Richard J. Cook photo/courtesy Allen County Museum. All rights reserved. The Ravenswood, Spencer, and Glenville Railway, henceforth abbreviated as the RS&G, affectionately dubbed as the “Rub, Snuff, and Grin”, originated with a connection to the Ohio River Railroad just south of the mouth of Sandy Creek. Situated at this junction was a wye enabling trains to enter the RS&G from the north or south as well as the same moving onto the river line. The wye also served an additional purpose for turning locomotives ---a necessary function especially during the steam locomotive era. The wye connection proved essential to the local operation. 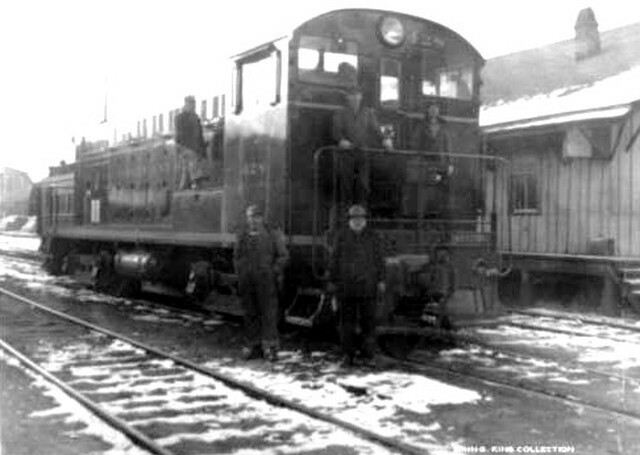 The north leg facilitated trains to and from the Ravenswood depot area to the RS&G---the south leg was useful to the integrated operation of the Ripley Branch to the south at Millwood. Located within the wye tracks on the river line, a concrete foundation remains from either a structure, phone shack, or perhaps a semaphore. If it can be determined what actually stood here, an update will follow. The Hartley Oil Company was founded in 1946 and was a B&O customer but not on the Spencer line during its early existence. When the RS&G was abandoned and track removed, Hartley Oil purchased the remaining track from the B&O in the early 1970s extending from RS&G Junction to the Sandy Creek bridge. The south leg of the wye was removed during this period with the pending construction of what was then WV State Highway 68 (now US 33). During subsequent years, Hartley Oil expanded its plant along this remaining stub and added additional sidings. It remains an active CSX shipper today. 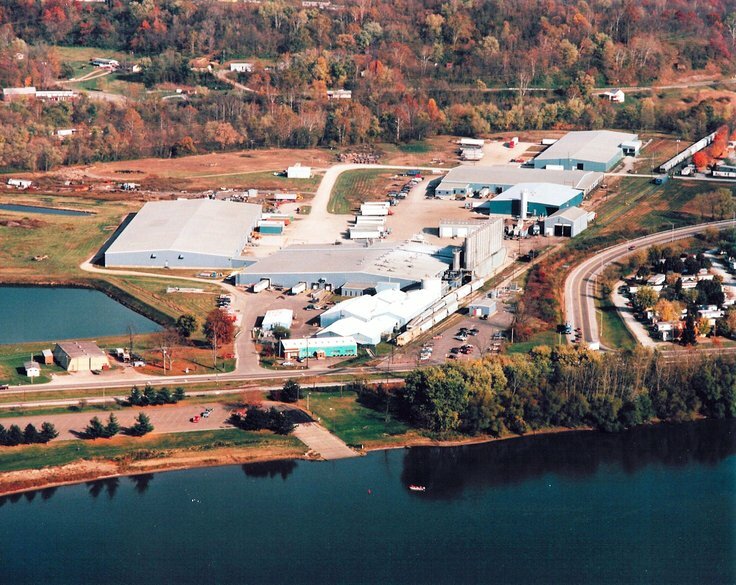 A 1990s aerial view of the Hartley Oil Company at Ravenswood. A view that not only captures the business complex and riverfront but what remains of the Spencer Branch in its entirety. 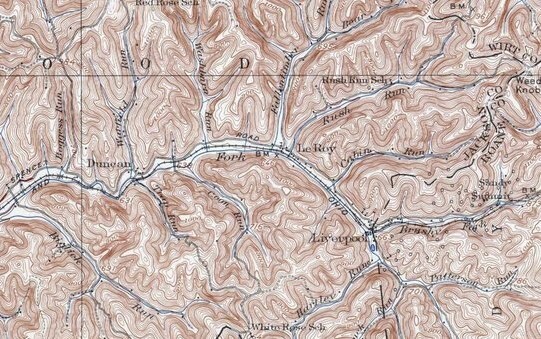 The covered hoppers at upper right mark where the line is stubbed at the bank of Sandy Creek. Image courtesy of Hartley Oil Company. Ravenswood was the connection to the outer world from the Spencer Branch. Passengers that boarded the train from Spencer or any of the other stops along the line traveled to Spencer often meet a connecting train on the Ohio River line. Perhaps some were destined north to Parkersburg or Wheeling or possibly south to Huntington. From those locations, connections could be made to destinations near and afar. 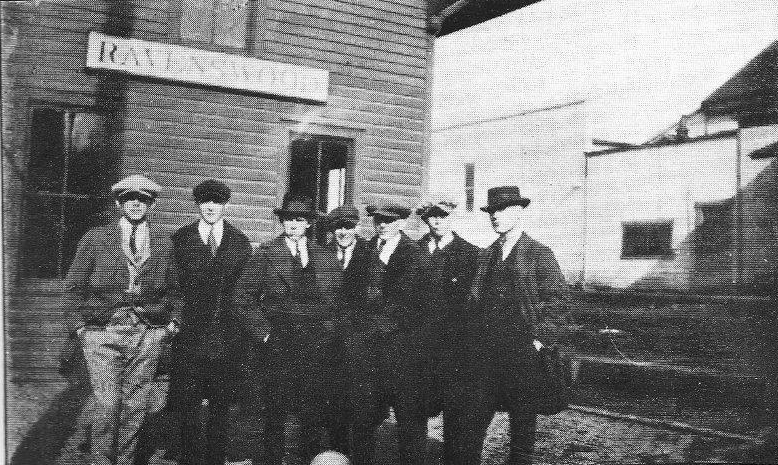 Passengers either boarded or disembarked at the Ravenswood depot depending on the direction of their travels. All of freight traffic to and from the Spencer line originated or terminated at Ravenswood on sidings near the depot. 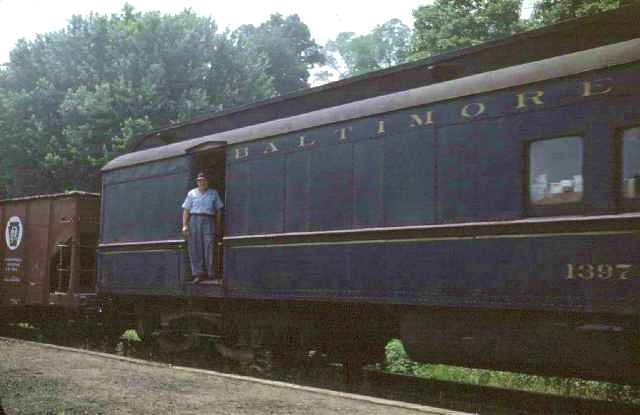 During the B&O years, trains with different numbers depending on the era picked up the cars to be delivered along the line; conversely, returned cars to Ravenswood for pickup by other trains. 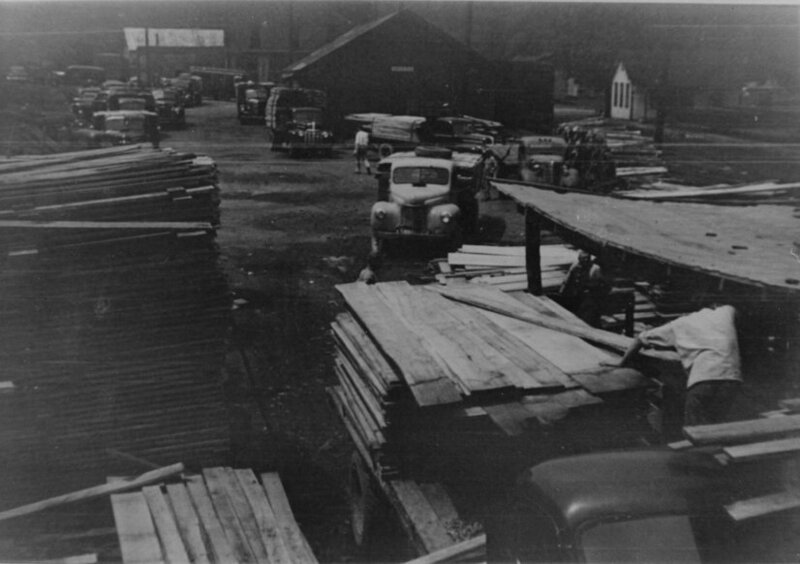 Records indicate by 1948 no shippers were located within Ravenswood along the RS&G. The possibility exists that perhaps one was located there early in RS&G history because the 1928 map indicates a siding at the location. Of note in the area of the RS&G at Ravenswood, street realignment and new highway construction changed the appearance. WV State Route 2 originally entered the town from the south and crossed the RS&G on what is now the access road to Hartley Oil and crossed Sandy Creek. Look again at Richard J. Cook's photo above and notice there is no highway to the left of the track. WV Route 68 paralleling the Ohio River and crossing the RS&G at its junction with the river did not yet exist in this area. As a footnote, the town of Ravenswood will be presented with more detail in a future piece about the Ohio River line as it is predominately situated on that route. Upon moving east from Ravenswood, the railroad paralleled Sandy Creek bypassing it in two locations to avoid snaking bends. The first was at Silverton and moving eastward, the first of three tortuous grades on the route at Crow Summit. At Sandyville, the line then followed the Right Fork of Sandy Creek running through rich bottomed farm land and multiple small creek crossings. 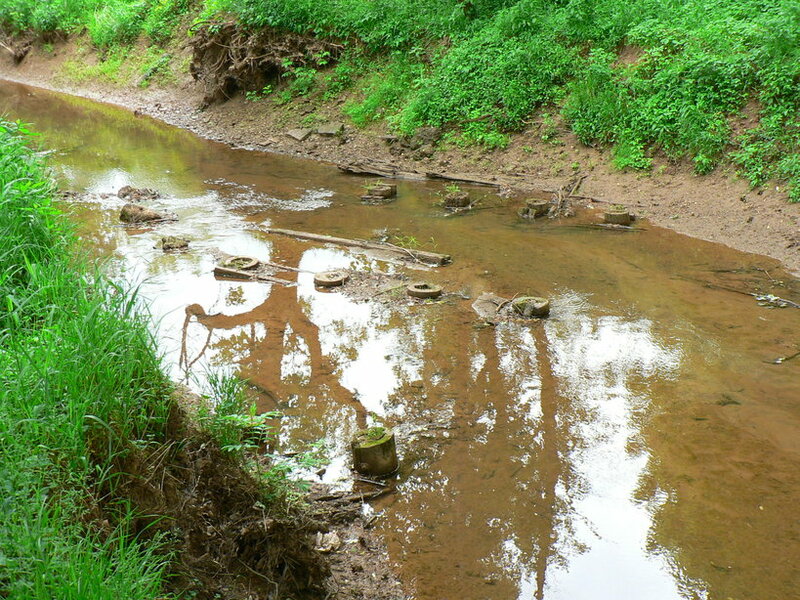 Once the railroad crossed Sandy Creek, it immediately parted from the stream to bypass a twisting bend. It swung around a hill following what is now old Route 56. It then crossed what is today the joint US 33/State Route 2 four lane highway and ran creek side again into the community of Silverton. 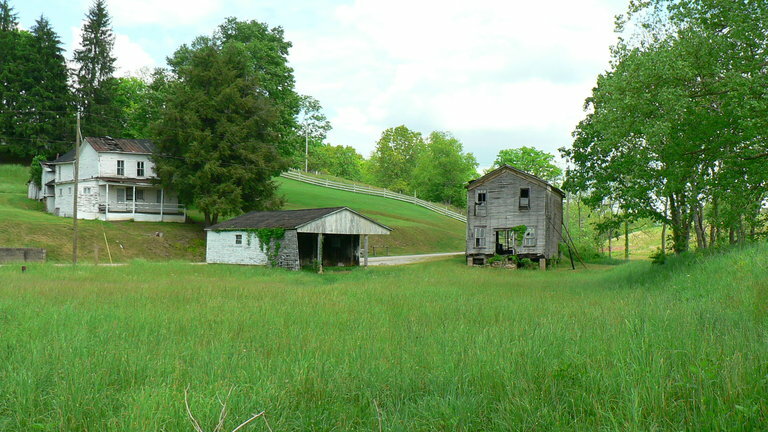 There is evidence of a siding having been located in the older section of Silverton that is west of present day Interstate 77 that possibly served an early grain mill known as Silverton Mill. B&O records indicate no existing shipper at Silverton by 1948. To date, I have not discovered what was located here if it was more than a depot. No traces remain of a past shipper here otherwise---this area was redeveloped with the coming of the Interstate. The location was a flag passenger stop. This 2003 Google Earth image offers a modern look of the Silverton area. Construction in this area beginning with I-77 modified the railroad right of way and continued with the four lane highway into Ravenswood. 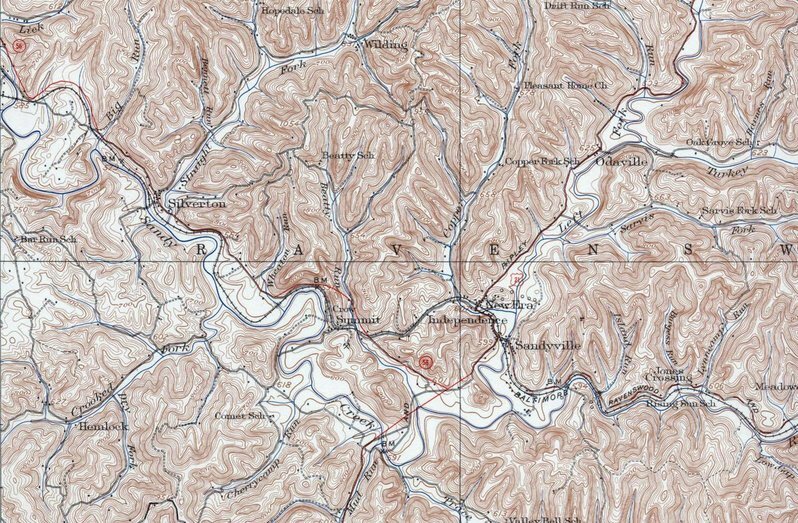 Railroad roadbed is shown in red as is the location of a siding that existed at Silverton early in the railroad history. Throughout its winding 32.7 mile route, the integrity of the abandoned railroad right of way has remained intact with but few exceptions. 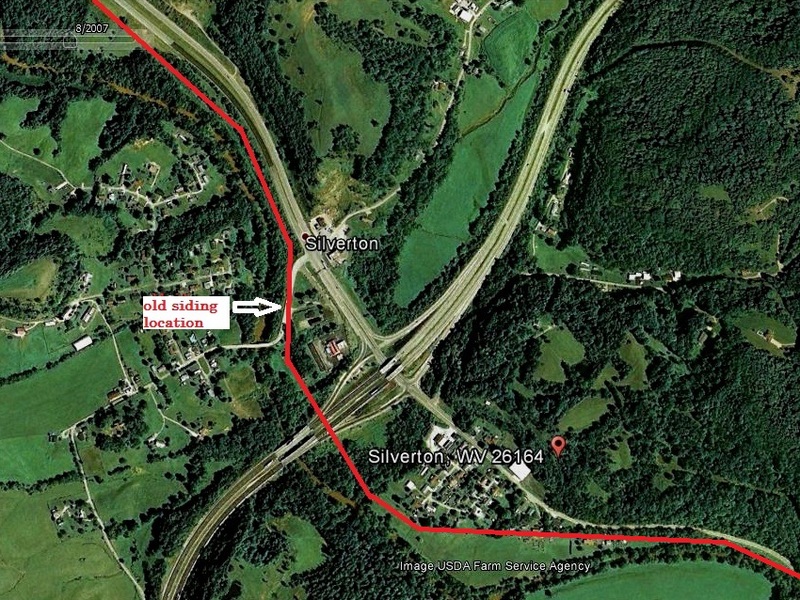 The most significant alteration has been at Silverton. The construction of the Interstate first violated it by the early 1970s and the subsequent development of Highway 68 (later US 33/Route 2) further infringed upon it. Most golfers that play a round at the Green Hills Country Club today may not realize that trains of the B&O once passed through at the edge of the course. When the country club was developed in 1959, the railroad was still active---today the roadbed is readily traced through the course. Moving east from Silverton, the RS&G paralleled Sandy Creek and Route 56 for almost a mile before the railroad turned to follow the creek opposite a respectable size hill. Only a few miles out of Ravenswood, B&O trains faced the first test on the trip to Spencer. East of Silverton was the first of three arduous grades to be found on the route. It was here that the climb began on that respectable sized hill to a point known as Crow Summit. Train #457 crosses Crow Summit trestle and will drift downgrade into New Era and Sandyville. Tough to tell how many folks are riding in the combination coach---if any---to Spencer or a point between this day in 1951. Mr. Cook took this photo from Independence Road at the intersection of WV Route 56 to catch the Ten-Wheeler and train. Richard J. Cook photo/courtesy Allen County Museum All rights reserved. The assault on Crow Summit by the railroad was facilitated to avoid twisting and untraceable bends in Sandy Creek and its tributaries. Either way, it was not possible to construct track on by any method resembling a tangent. 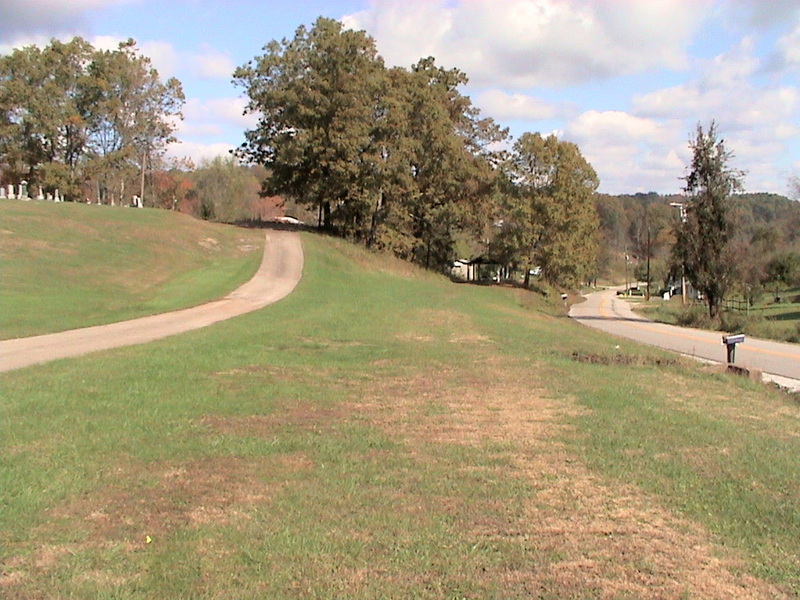 As an alternative, the RS&G constructed the road on a grade ascending as it paralleled Sandy Creek curing to the peak of the hill separating Sandy Creek and Beatty Run. 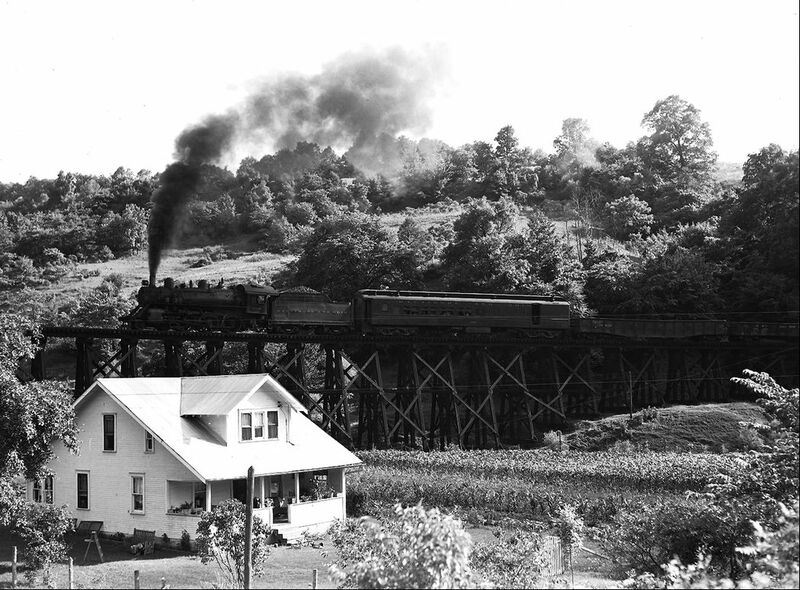 The line then began a gradual eastward descent downhill spanning Beatty Run on a long trestle combined with a deck bridge over present day Old WV Route 56. B&O and West Virginia County documents mention a small depot that was located at Crow Summit in addition to a short siding. This was used to double the train upgrade when necessary. During the May 2015 visit to the area, the only remaining traces I found here were stray trestle bents used for fence posts. Brush and undergrowth has completely overwhelmed the hillsides where Crow Summit trestle once stood. This is simply a terrific photograph. Train #458 is running upgrade to Crow Summit on its namesake trestle in this wide angle view. Shot in 1951 looking north on WV Route 56 and provides a clear look at the bridge span over the road. How vastly different this appears today. Richard J. Cook photo/courtesy Allen County Museum All rights reserved. After the railroad spanned the ridge on the trestle at Crow Summit, it drifted down a grade eastbound into the community of New Era paralleling Independence Road. 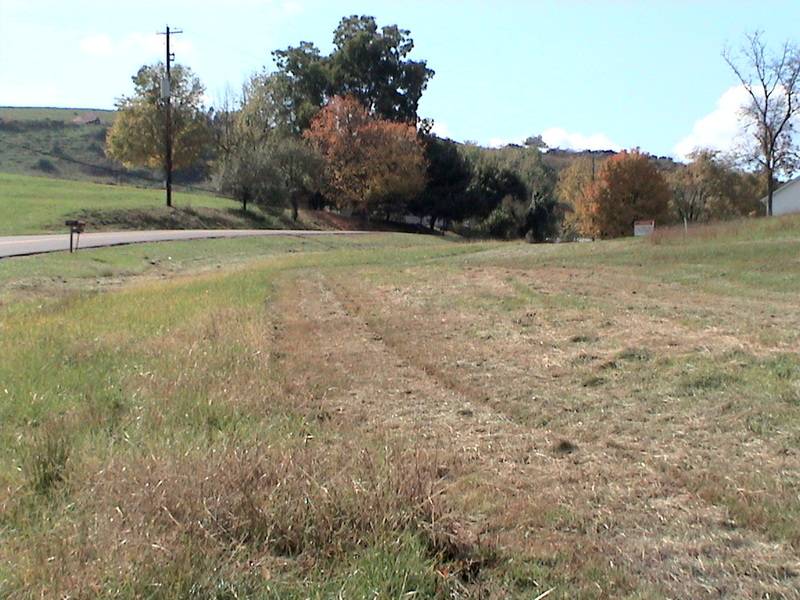 The line ran on a ridge above the road until crossing WV Route 21 at grade at the intersection near Independence Road. Folks not familiar to the area can be confused at New Era simply believing it is Sandyville. 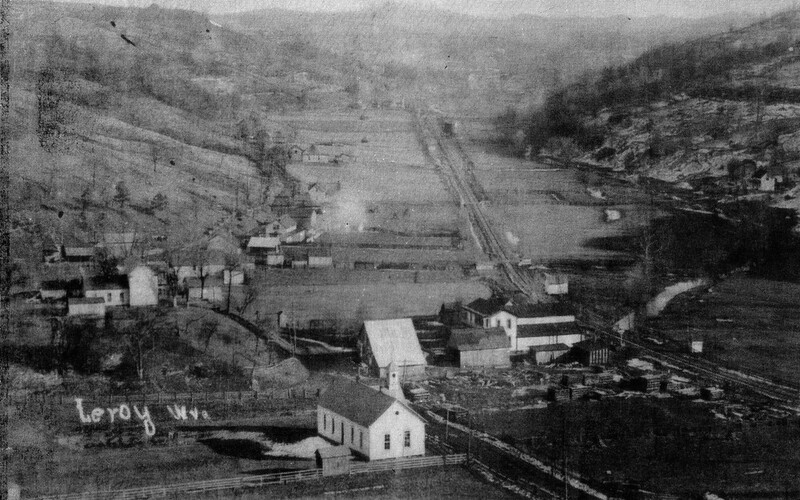 In reality, the railroad Sandyville was to the west centering at the Liverpool Road area where it intersected with WV Route 21. B&O listed three shippers in the area between Crow Summit and New Era still active in 1948. These companies in order moving east were Eureka Stone Company, Constitution Stone Company, and Columbian Carbon Company. 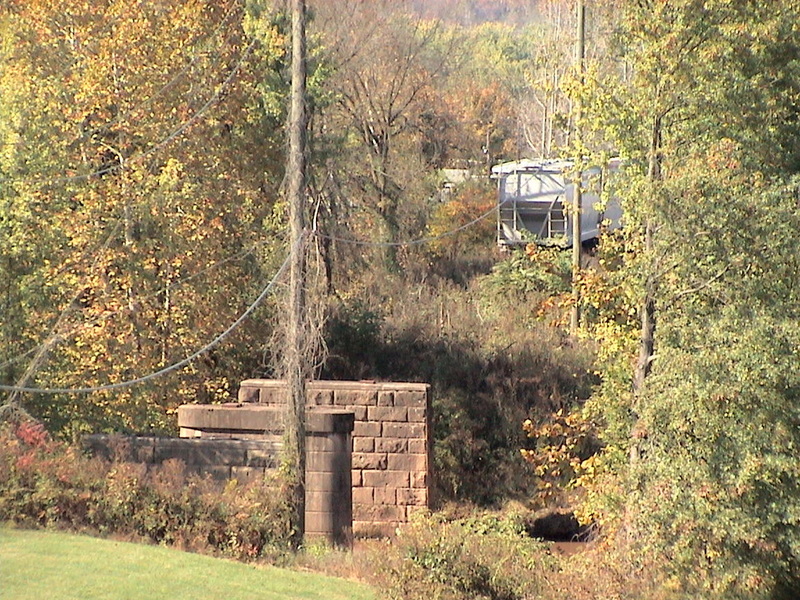 There is a wide area at New Era along the railroad roadbed before the Route 21 crossing where the latter two were located. B&O records indicate all three were served by the same spur. 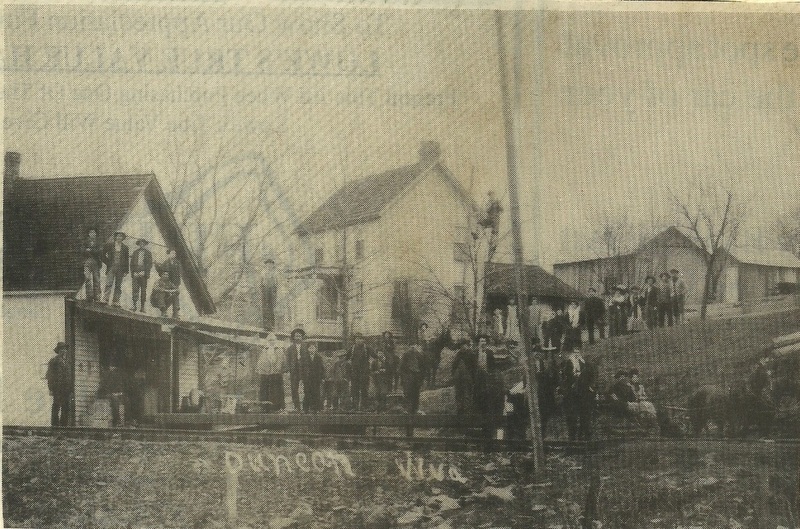 Train time at the Sandyville depot as it was during the early 1900s. The locomotive appears to be a class 4-4-0 American. Image courtesy Jackson Herald. Sandyville, where the Right and Left Forks of Sandy Creek converged into a single stream, became the second most prominent shipping point on the RS&G. Only Spencer shipped and received more total carloads. In addition, it was among only three scheduled passenger stops between Ravenswood and Spencer as the majority were flag only. Sandyville was to Ravenswood what Reedy was to Spencer---the passages to the meadows and rolling hills of Jackson and Roane Counties. Rare color image of Train #458 at Sandyville. Location is Liverpool Road grade crossing at intersection of US Hwy 21 and is also notable due to the caboose since it was not required on the RS&G. Image Gordon Depew/Scott Greathouse collection. Sandyville held the distinction as the location for the only "heavy" industry on the RS&G. The Sandyville Oil Company was located to the east of town in a wide bottom that also accommodated a siding for the tank cars it received. This operation transitioned through two subsequent owners throughout the years---Virginia Gas and Oil and finally, Cumberland Gas and Oil. Although no specific date has yet been determined, this industry appears to have disappeared by the early 1960s. 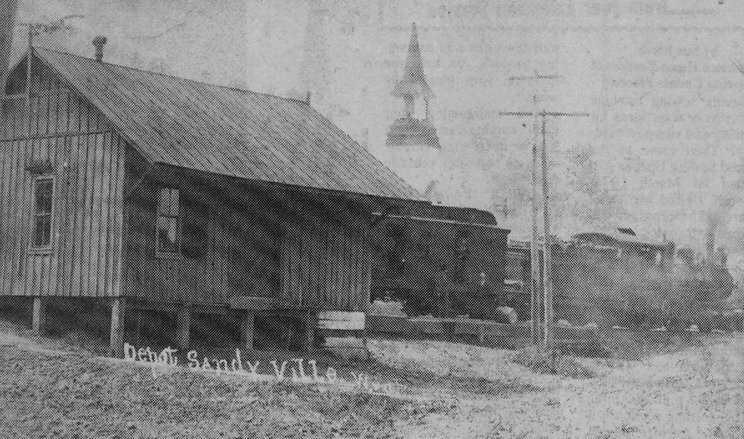 In addition to serving the local passenger base, the Sandyville depot was among the more active along the line. It handled a respectable amount of general freight for the local businesses and agriculture. Once the railroad left Sandyville and continued its eastward trek, it became a bottom land route as it moved through the northern countryside of Jackson County. Following the trace of Right Fork of Sandy Creek, the line meandered with the stream as it twisted and curved through the low valley. In keeping the railroad as straight as the terrain would permit, its construction afforded numerous bridges that crossed both Right Fork and its tributaries that typically are small brooks. Relatively little has changed during the passing years here. The area looks much the same as it did when the B&O passed through on its daily trek to Spencer and the return to Ravenswood. 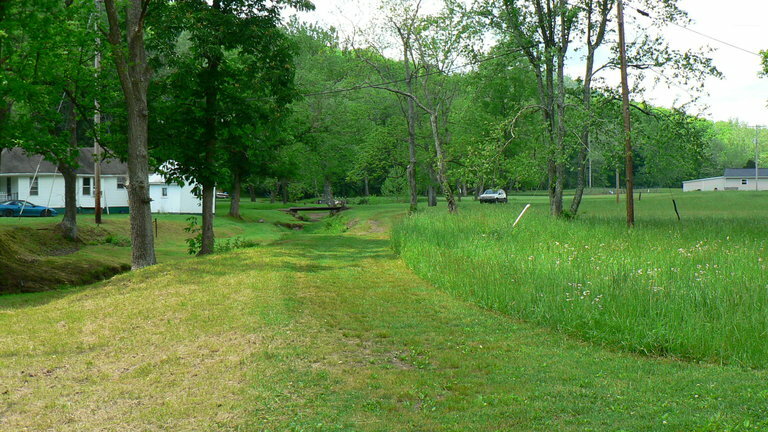 There are locations where the right of way is distinctly visible such as tree lines patches in the meadows and areas adjacent to the creek. More subtle and upon closer examination are the remains of the bridges that spanned the creek crossings. Only sawed off pilings remain at most whereas there are sectional pieces still intact at others. Community names such as Jones Crossing and Meadowdale no longer appear on present day maps. To find them, one must examine maps from the distant past when cartographers included detail to a meticulous degree when not only tiny hamlets were added but also the area schools. Railroads also acknowledged the existence with the inclusion into timetables as flag whistle stops as needed. 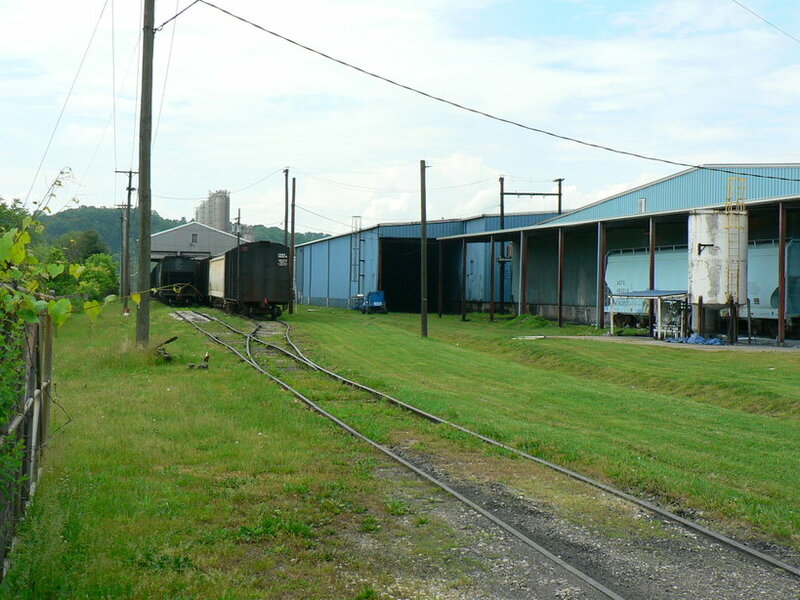 B&O records reflect no remaining shippers located in this area as of 1948 but a company siding existed at Meadowdale. If any rail customers were here during the early years of the railroad, it no doubt was agriculturally related. Today, these areas are quite sparse with the occasional house or farm scattered within their confines. But years ago, these areas were settled by families---often bearing the name to a degree. Generational families remain as well as migration into the area by others with no previous connection. Paralleling both Right Fork and Liverpool Road, the railroad continued its route through farmland touching small hamlets such as Duncan, Leroy, and Liverpool. It was at the latter that it entered Roane County and began the ascent on the toughest grade along the route reaching its zenith at Sandy Summit. In terms of mileage, the region from Duncan to Sandy Summit was the heart of the RS&G. As the midpoint, it offered a microcosm of what embodied the line---a good sampling of farmland running through small hamlets culminating with the ascent from Jackson into Roane County attaining the peak at Sandy Summit. Defining attributes within the area were the frequent creek crossings on small bridges with the right of way traversing the meadows. At certain locations, the Right Fork of Sandy Creek hugged Liverpool Road with the railroad fitting snugly between both. By any account, the climb from Liverpool to Sandy Summit was the dramatic feature which included two impressive wooden trestles. 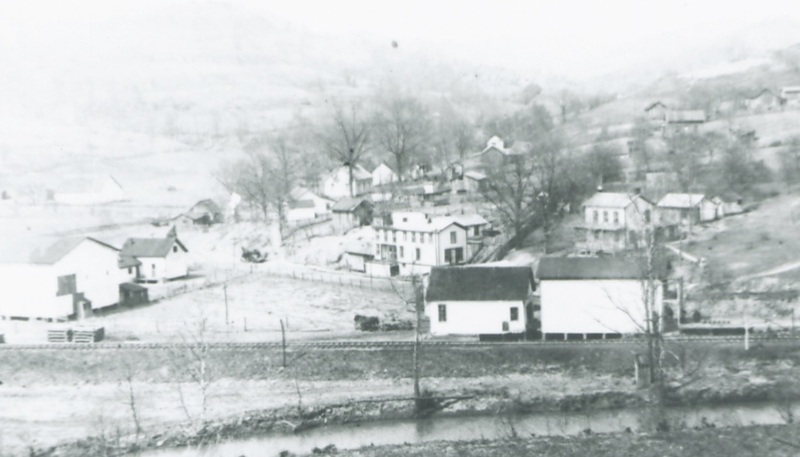 The community of Duncan as it appeared circa 1915 in a photo taken from the hill opposite Right Fork of Sandy Creek. The railroad and post office are visible in the foreground. Image courtesy of Edith Viskochil. Scanned from old newsprint, this image is believed to be from 1892. The townspeople of Duncan await trackside for the passage of the first train to Spencer. Some have obviously found premium observation points. Image courtesy Jackson County Historical Society. Remnants of bygone years remain at Duncan. 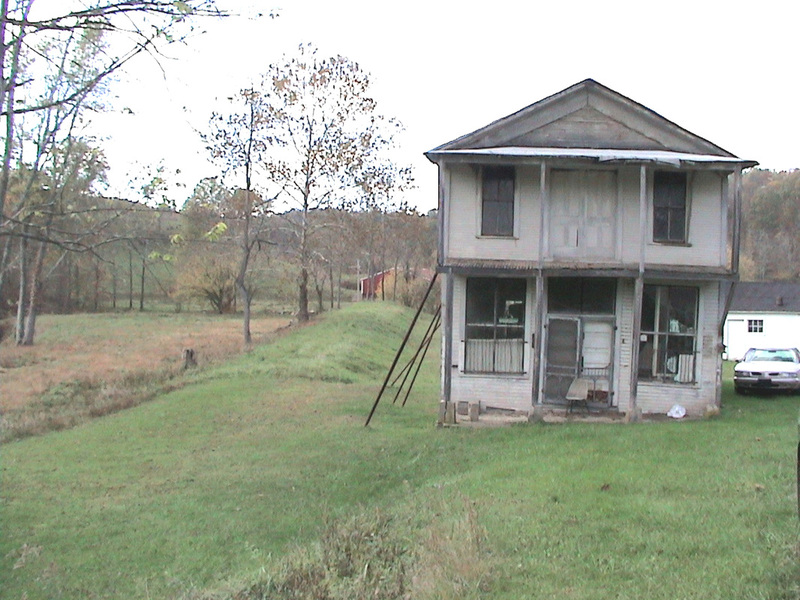 Older houses still exist that date to the early 1900s situated along Liverpool Road overlooking the bottom land and creek whence the railroad ran. 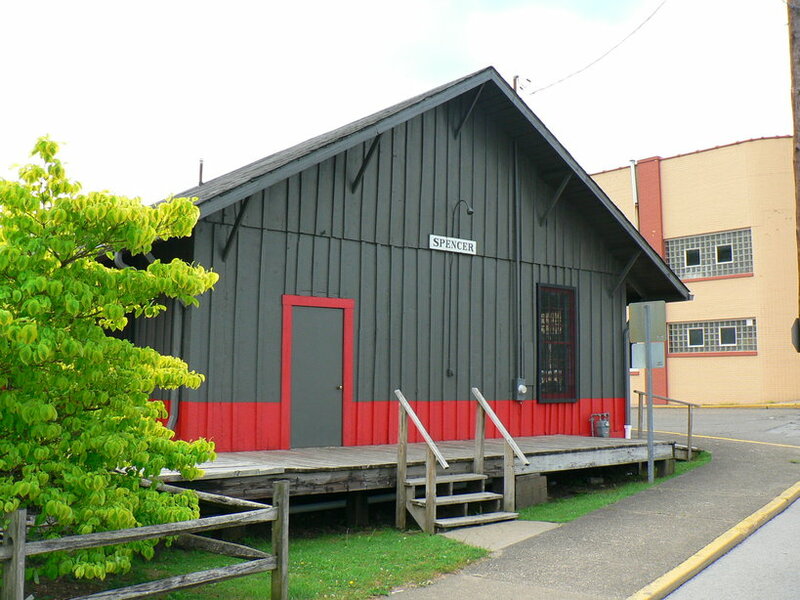 Still standing today is the Duncan post office building situated beside the railroad roadbed that was the center of the community in its heyday. Based on its orientation, this structure likely served as the railroad agency selling tickets for either Ravenswood or Spencer or points between. As a flag stop, this would have occurred only when a passenger would board or disembark here. B&O lists no shippers of record here by the late 1940s. Continuing the eastward trek, the next hamlet along the route was Leroy. This, too, was a farming area and remains so to this day. A more modern post office building exists here suggesting that it was a replacement from an earlier era. The name of this community offers a dual spelling. The original listing was as LeRoy but the more frequently used version is Leroy. According to the writings of John House—a genealogist of Jackson and Roane Counties during the early 1900s ---a family with the name of Roy settled here of which the name may have derived. Leroy was a flag passenger stop and there is no record from B&O of any shippers located here. 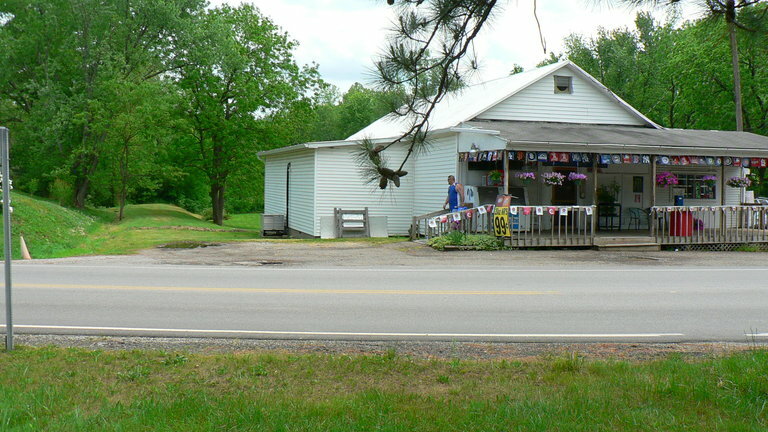 A touch of England found its way to the farmland of northern Jackson County when the community of Liverpool was named. Straddling the Jackson-Roane County line, it was the eastern end of the RS&G trek across meadows and farmland before the ascent on the Sandy Summit grade. 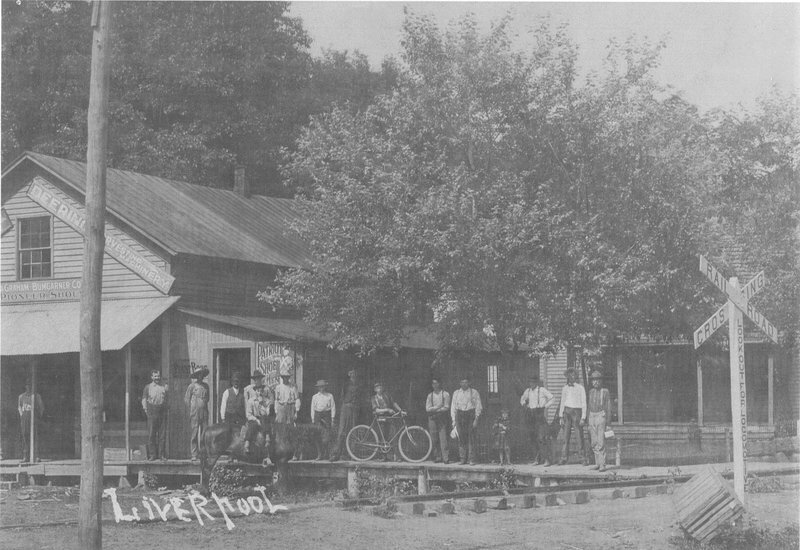 During its heyday in the early 1900s, it hosted a general store at a crossroads location serving the outlying region of the two counties. The Liverpool of today remains as a quiet farming community situated in a serene creek valley punctuated by meadows and rolling hills. B&O listed no shippers here by the late 1940s but a short siding remained in place that was used as necessary. Liverpool was classified differently as a passenger stop depending on the direction of the train. It was a flag stop for Spencer bound trains but a scheduled stop on the return to Ravenswood. Train #457 works upgrade on the first of two trestles on the eastbound climb to Sandy Summit. 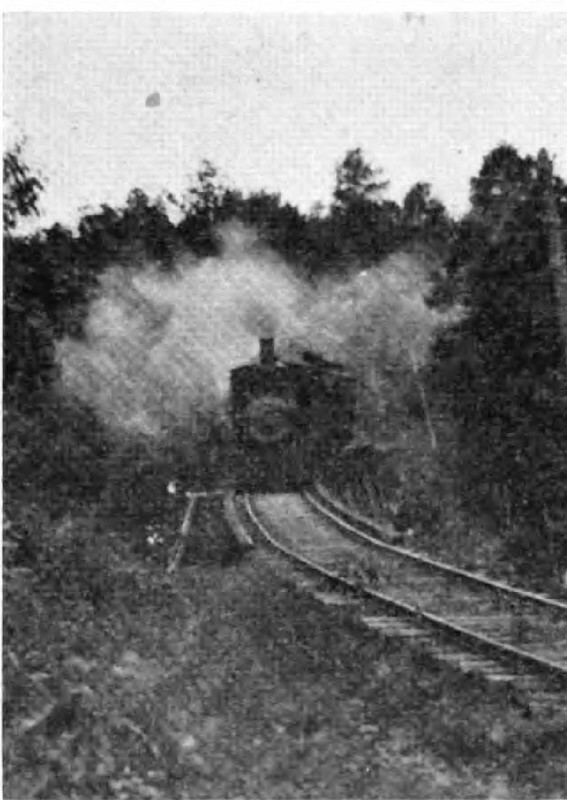 Black smoke bellows out of the Ten-Wheeler as it fights gravity on the grade. 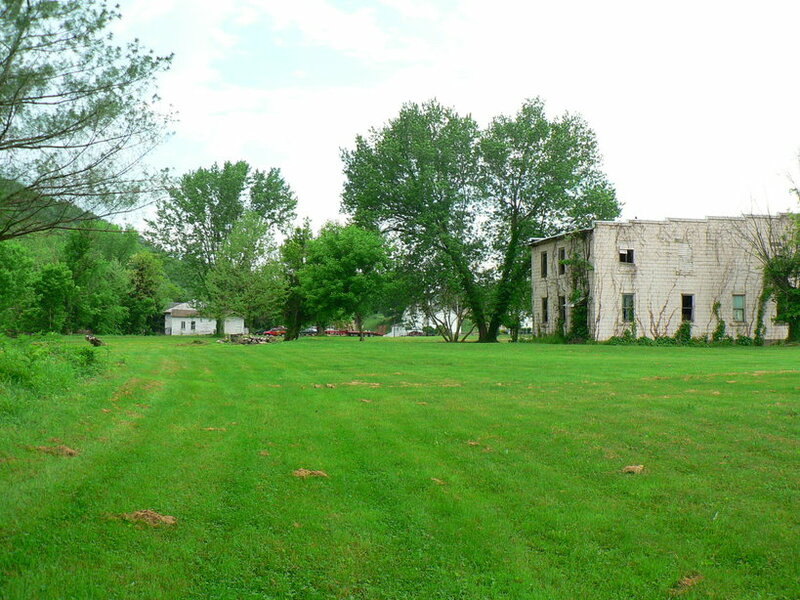 The folks that lived in this farmhouse in 1952 were accustomed to the sound of a train passing by twice daily so it was simply a day in the life just as the growing corn in the field. Flavorful period photo by any measure. Richard J. Cook photo/courtesy Allen County Museum. All rights reserved. Moving east, Liverpool Road begins it climb to the Sandy Summit divide along Brushy Fork. 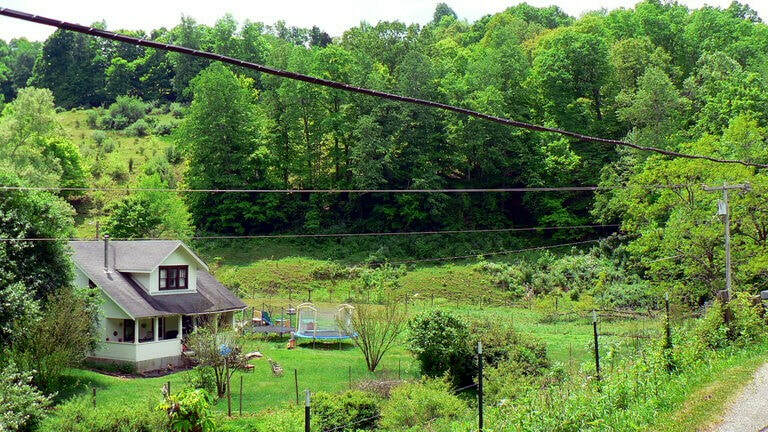 The railroad right of way can be traced moving upgrade on the ridge opposite the road until a cut separates the ridge—this was the location of the first trestle marked by a farmhouse in the bottom below. Continuing the climb on the road, the roadbed mirrors this ascent until leveling out at the top. Here the railroad spanned the cut from the opposite ridge to the bank beside Reedy Road---the location of the Sandy Summit trestle. It then paralleled the road a short distance to a grade crossing moving to the opposite side of the road. The outline of the roadbed on Sandy Summit is defined clearly as seen in winter and for many years, remains of Sandy Summit trestle were visible from Liverpool Road. On my visit in May 2015, I did not see it, however. Perhaps it was obscured by growth or in fact, no longer intact. Inexplicably, this section of trestle was left in place but historically displayed a time capsule of what once was. This is a Richard J. Cook classic and is among his best known images that has appeared in publications. 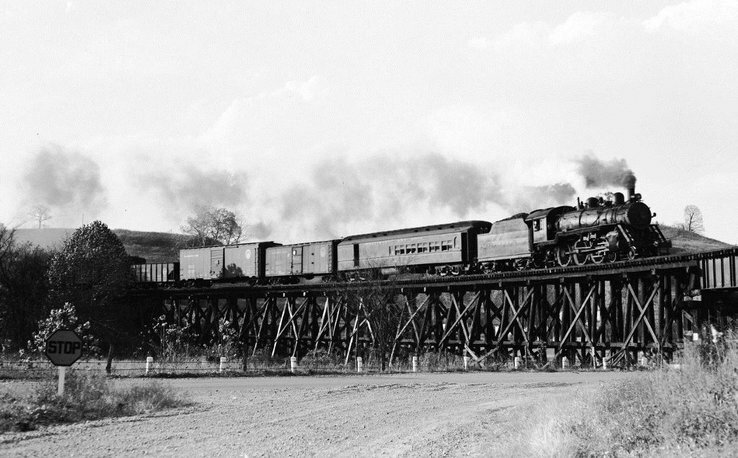 Train #457 bound for Spencer nears the crest of the grade at Sandy Summit trestle in this wonderful 1952 photo. Mr. Cook set up on Liverpool Road overlooking the trestle and not only froze the train for posterity but captured other elements of the area such as the farm setting and oil wells. Looks like a few passengers are enjoying the ride this day. Photo Richard J. Cook/courtesy Allen County Museum. All rights reserved. Aside from the endpoints of the railroad at Ravenswood and Spencer, Sandy Summit was perhaps the best known location along the line. As the second of three tough grades on the RS&G, it was also the steepest. Featuring two high trestles---one on the west slope and another at the summit---it became the signature point for Richard J. Cook’s photographic work along the RS&G that has appeared in publication and which graces this page. Drifting downgrade from Sandy Summit, the railroad entered the Reedy Creek drainage along its Right Fork passing through Seamon and Dukes before arriving at Reedy. 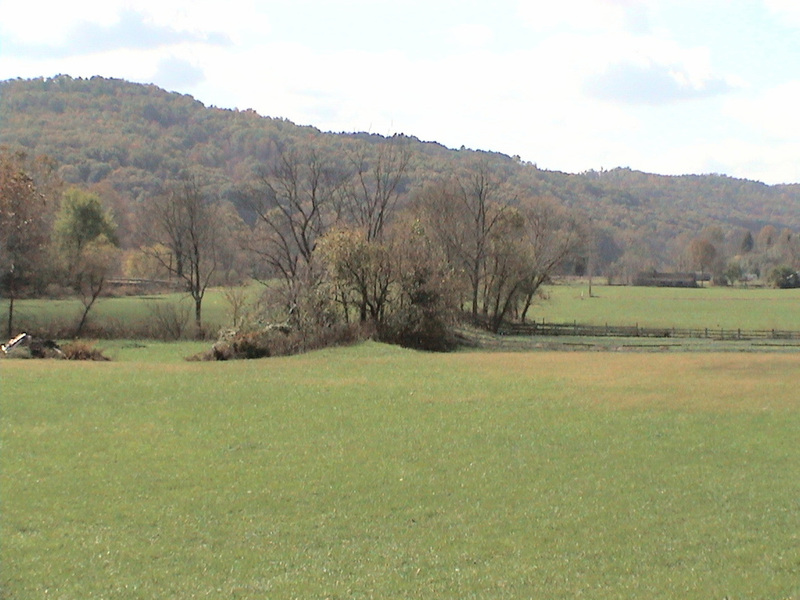 From this point, the railroad turned south following the course of Reedy Creek and WV State Route 14. Along this stretch, it resumed running through farm land reaching the community of Billings. On the ridge top past Sandy Summit is a tiny community on older maps known as Sunflower. B&O recognized this place name in earlier years on its timetable as a flag stop. This area consisted of homes spread across the hillside past Sandy Summit---and still does today--- and prior to the descent along the eastern slope to the place names of Seaman and Dukes. The railroad ran to the north of Liverpool Road through here until crossing to the opposite side before reaching Seaman. The topography differs on this slope as opposed to the west end of Sandy Summit. 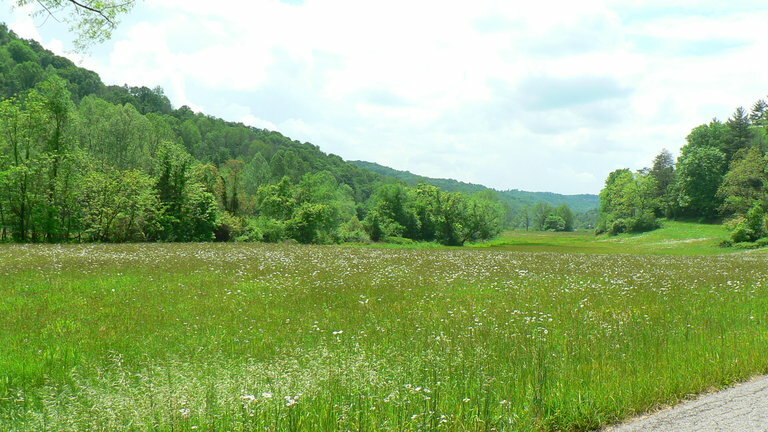 Whereas the valley and hillsides are steeper on Brushy Fork to the west, the source of Right Fork Reedy Creek is a wider basin with small meadows. Higher hills and deeper cuts separate the headwaters of Sandy and Reedy Creeks. Mr. Cook did not specify the exact location here but it appears to be a trestle located between Sandy Summit and Seamons. Ten-Wheeler #2020 works in helper service shoving a heavier train this particular day in 1952. Image Richard J. Cook/courtesy Allen County Museum. All rights reserved. The 1948 B&O shipper register records a short siding that was located at Dukes. 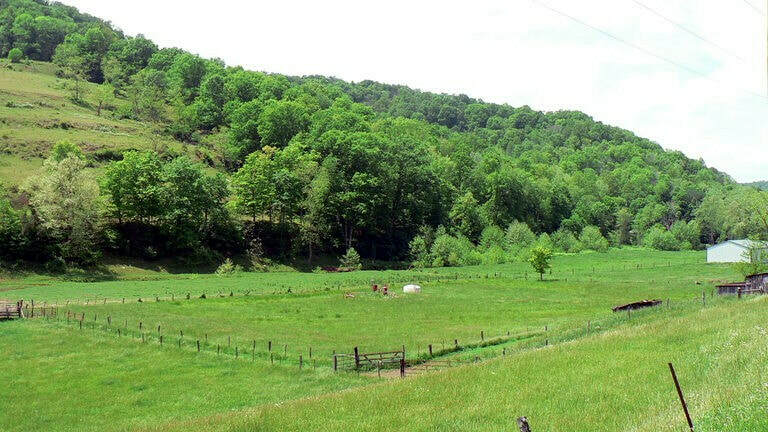 A livestock pen was situated here for watering which accounts for the use of the siding. A 2003 Google Earth snapshot of the area west of Reedy to Seaman along Right Fork Reedy Creek. Railroad right of way highlighted in red as it parallels Liverpool Road passing through the small communities. The area between Dukes and Seaman is where the line began its westward ascent to Sandy Summit. John House wrote of the early history of Reedy describing the bustling community it was. 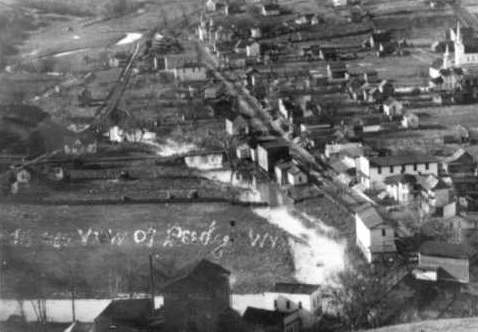 Indeed, outside of Ravenswood and Spencer, Reedy was the largest town along the RS&G in terms of population and a commercial district. The town was not a large source of revenue for the B&O in terms of a major shipper but certainly freight changed hands at the depot in earlier years. It remained a scheduled westbound passenger stop through the existence of the railroad and generated a good percentage of the R&SG passenger base. 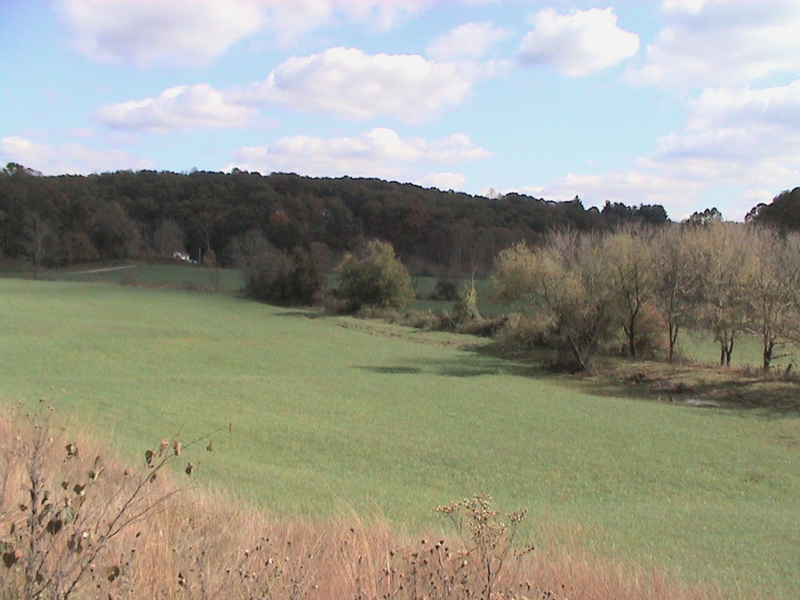 Its geographical location was somewhat strategic as it granted access to the railroad for residents of nearby Wirt County. B&O listed no shippers of consequence remaining at Reedy by 1948. 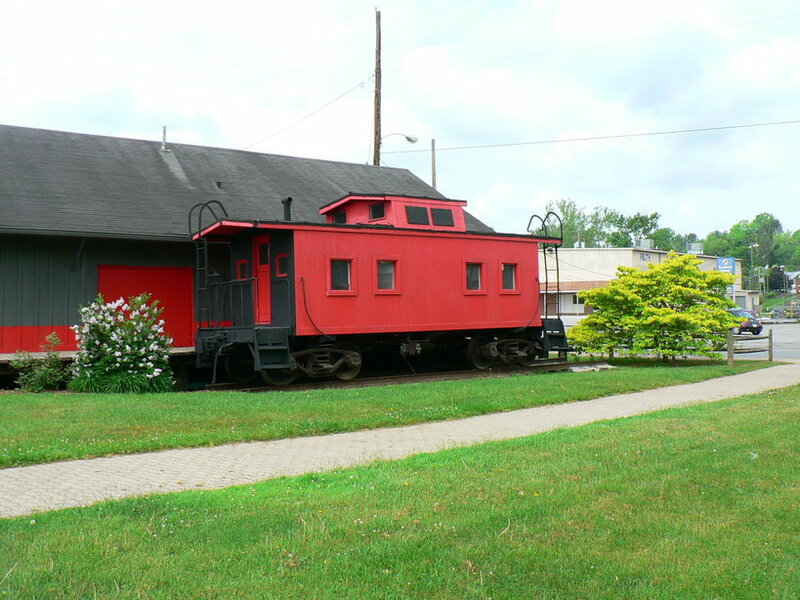 From an operational standpoint, Reedy hosted a short siding that remained until the later years of the railroad. Perhaps it was used for freight in earlier years or for storage as needed but followed a pattern of an available siding averaging five miles apart. Of more frequent use was the water stop here stationed here for westbound trains returning to Ravenswood. The water station at Reedy was erected in compliment to one that existed at Spencer. Once the last 4-6-0 ran the line in 1953 and was replaced by a diesel, the water stop was rendered moot and obsolete. 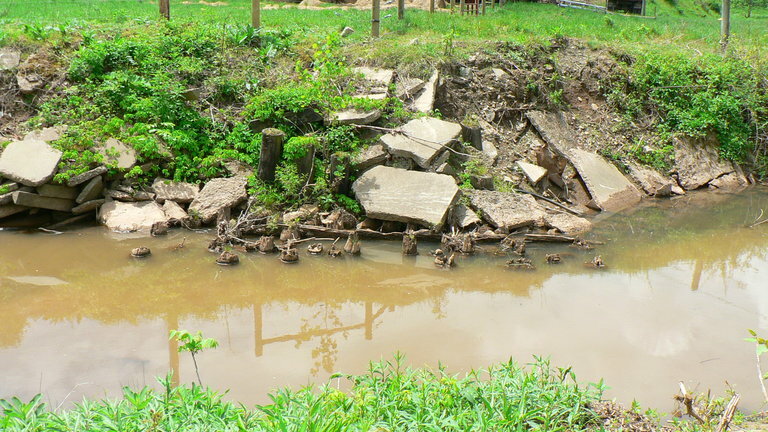 Bridge pilings remain in the bed of Right Fork Reedy Creek. Sawed off just above water level after the railroad was abandoned, this heavy timber found other uses. Dan Robie 2015. There is a large percentage of the railroad east of Sandyville that runs through bottomland that was vulnerable to high water. Sandyville to Liverpool is most notable and during recorded eras of serious flooding or even the random flash flood, the railroad right of way suffered washouts. 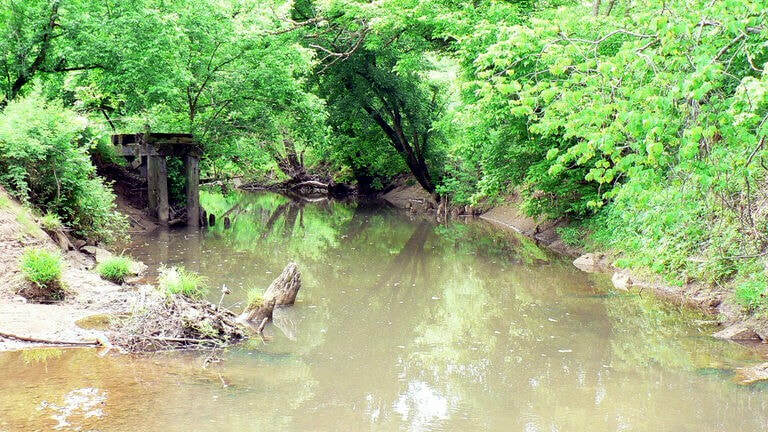 Reedy was another location that was prone to high water at the junction of three forks of Reedy Creek. John House, in his detailed accounts of the early 1900s, wrote that the location which became the town was originally a marshy bottom. Also noted was continued vulnerability to flooding and the RS&G reworking the right of way. Incidentally, in correlation to the location, Three Forks was an early name for the community until the name was changed to Reedy. As the railroad moved east through Reedy, it ran on a brief tangent before crossing all three forks of Reedy Creek in succession. The railroad then turned southerly following the basin of Reedy Creek. It basically continued a southern trek from this point all the way into Spencer. This is a 1951 damaged print from the Richard J. Cook/Allen County Museum collection that is still significant for use here. 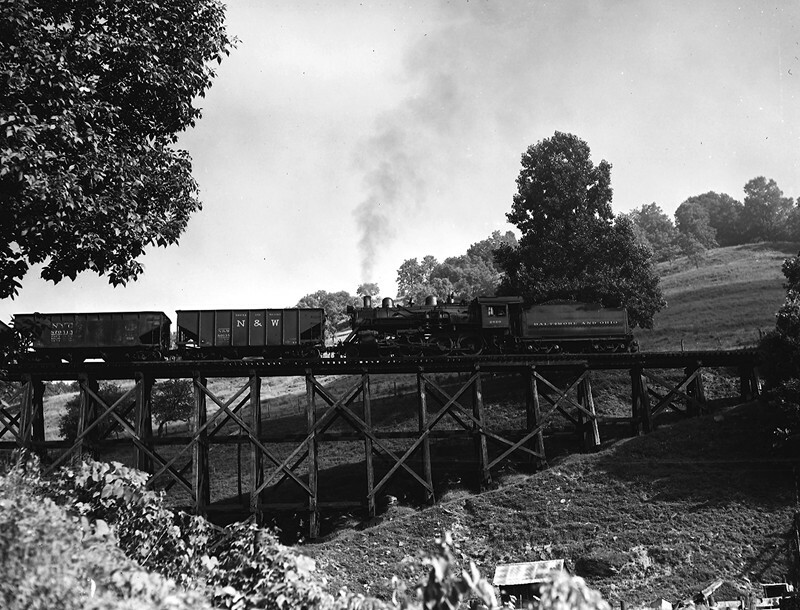 Mr. Cook identified this as "Train 458 on trestle near Reedy". Intensive study of maps and this area points to only one location this could be---just east of town spanning the bottom and Reedy Creek before the line turns south for Billings. Once the railroad left Reedy, it paralleled Left Fork of Reedy Creek south swinging in a broad arc and entering a reverse“S” curve and then a tangent. It followed the west bank of the creek at a higher elevation located at the base of the hills. On the opposite side of the creek, WV State Route 14 also paralleled the stream moving in a general southward direction. The terrain here is farmland with sparse crossings of the railroad right of way by private roads. Of the entire length of the abandoned RS&G right of way, the region from Reedy through Billings to Barrs is still quite discernible. Relatively speaking, it was also a moderately straight stretch of track with only slight curves following the contour of Left Fork Reedy Creek. During my association with the area in the 1980s, at least two whistle posts were visible between Reedy and Billings. On the May 2015 visit, I did not see any---I either missed them or they have since been removed. Billings is the next community of consequence and B&O listed a short siding located here that was used in conjunction with livestock watering. 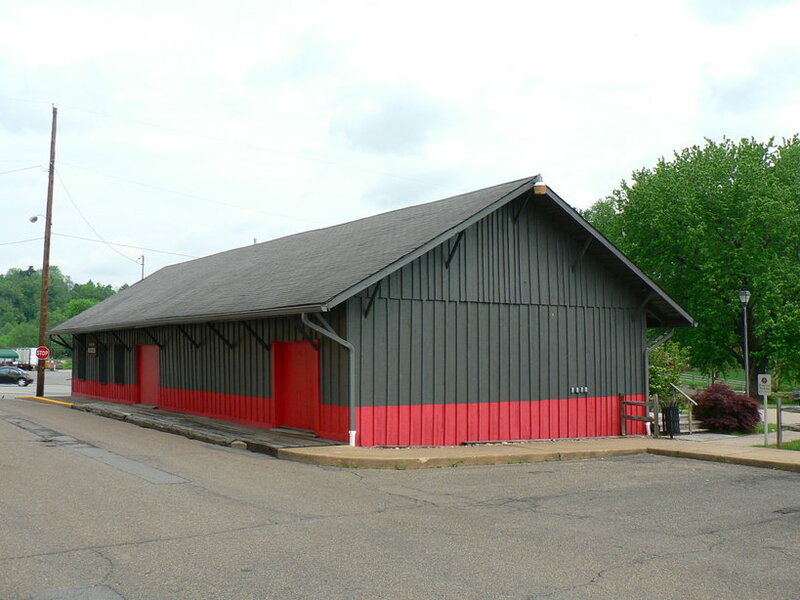 Hosting a small depot, the location was a flag stop for trains in either direction and handled mail and parcels. Today a section of the railroad roadbed has been paved for access to homes referred on the map as Billings Road. In the distant past, Billings was also known as Kyger or Billings Station. 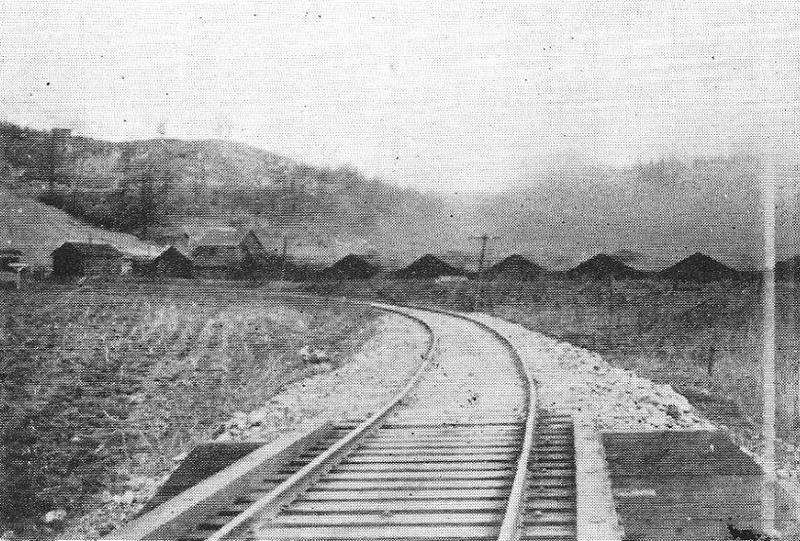 The railroad crossed WV Route 14 and ran the ridge above the road as it ascended upgrade to Barrs Cut. Once at the summit, it entered the Nancy Run basin descending to where it turned south to follow Spring Creek. 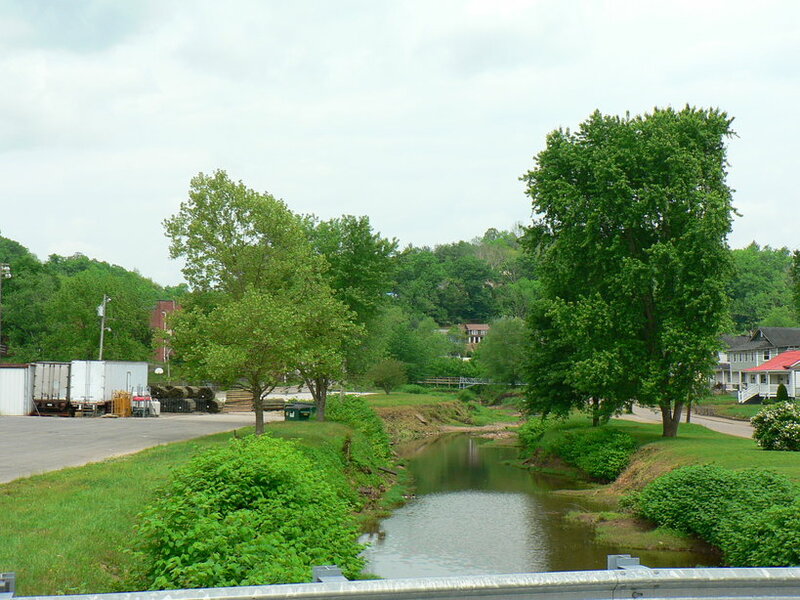 From here, the railroad followed Nancy Run and Spring Creek into the heart of Spencer where it terminated. 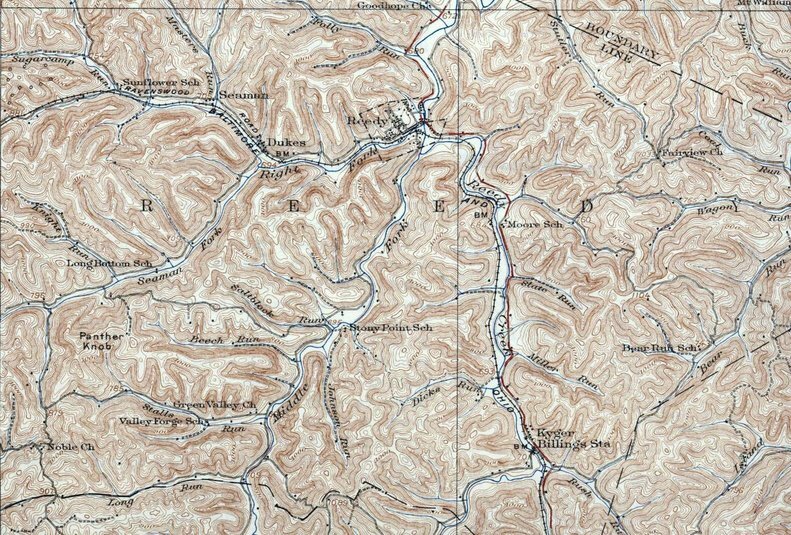 South of Billings, the railroad continued tracing the Left Fork Reedy Creek until reaching its headwaters at the convergence of smaller tributaries. 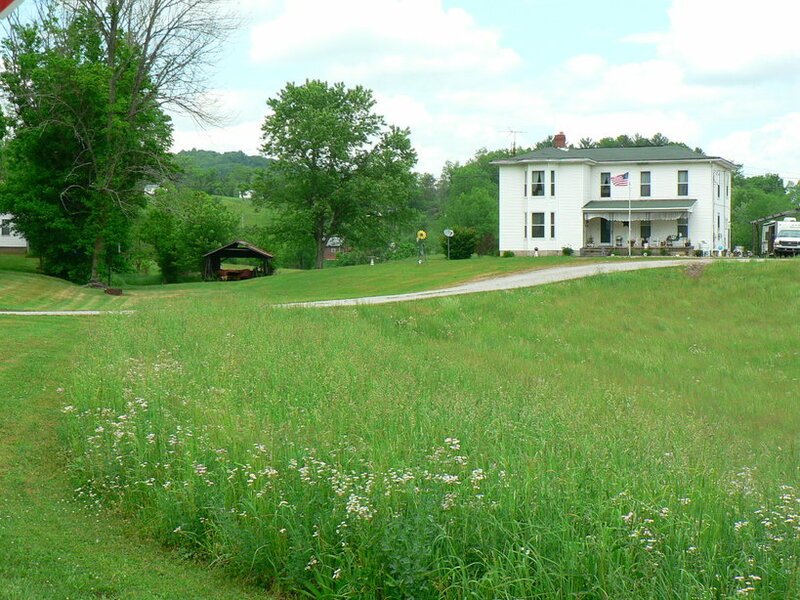 The right of way then crossed WV Route 14 and began the last of the three distinguished grades along the RS&G. The third, Barrs Grade, was not the steepest gradient but was the greatest in length. Starting at the WV Route 14 crossing on the western slope, it began a gradual ascent punctuated by the impressive Barrs trestle until reaching the summit on the ridge at the intersection of Bar Cut Road and WV State Route 14. The eastern slope drifted downgrade paralleling Nancy Run until this stream joined Spring Creek. Profile of Barrs grade from a Google Earth 1996 time stamp. 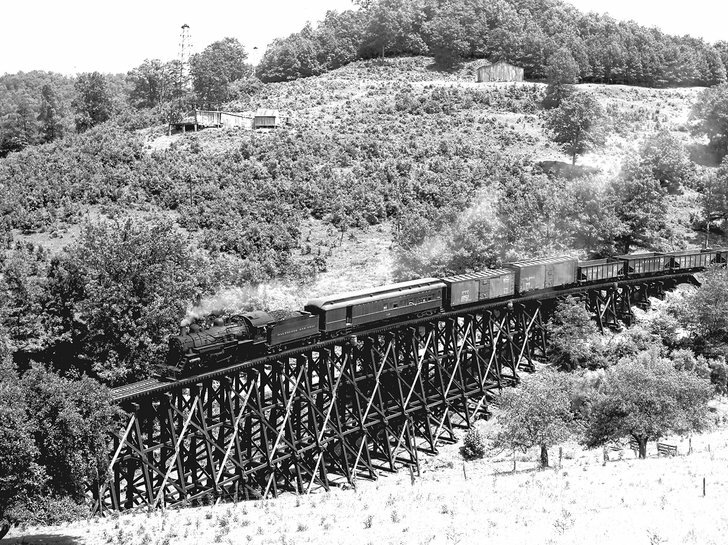 Railroad crossed WV Route 14 and immediately began a long ascent highlighted by the impressive Barrs trestle, Line continued upgrade on the ridge above WV Route 14 until attaining the summit at the intersection of Barr Cut Road. 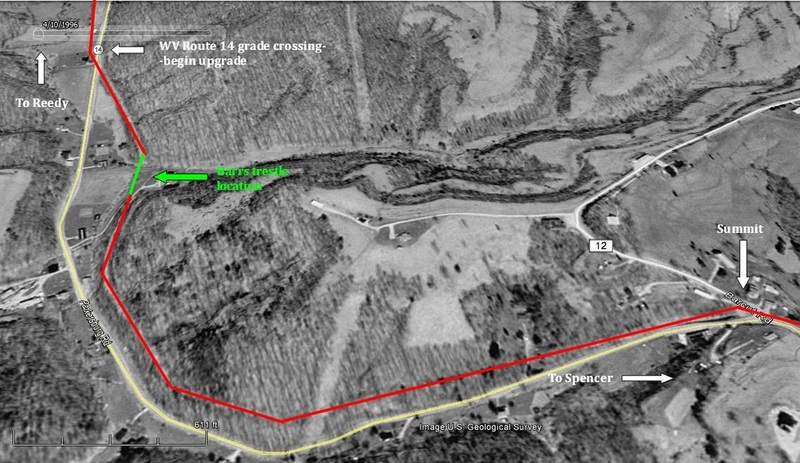 Right of way then began downgrade along Nancy Run heading into Spencer. The tiny community of Barrs was listed as a passenger flag stop by the B&O. A short siding was also located here for use if needed for doubling cuts of cars on Barr grade. Typically, this was the practice when only a single locomotive was the power for the train and tonnage high in proportion to the grade. Barrs became one of the better known locations on the RS&G by virtue of Richard J. Cook. 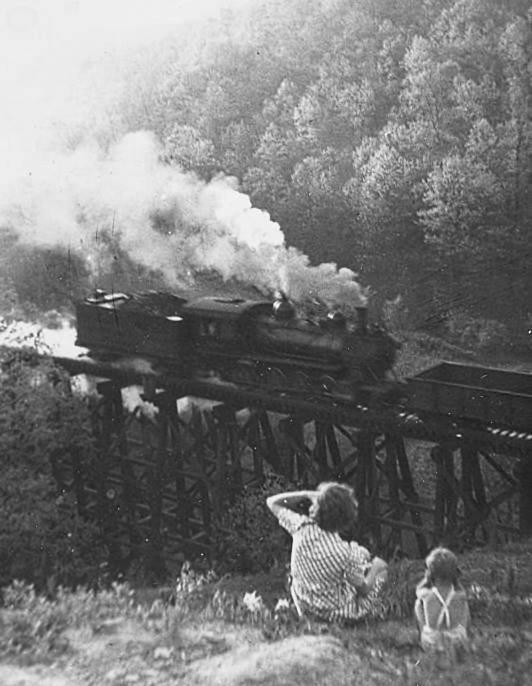 His photographs of trains on the trestle were published in books and periodicals throughout the years. 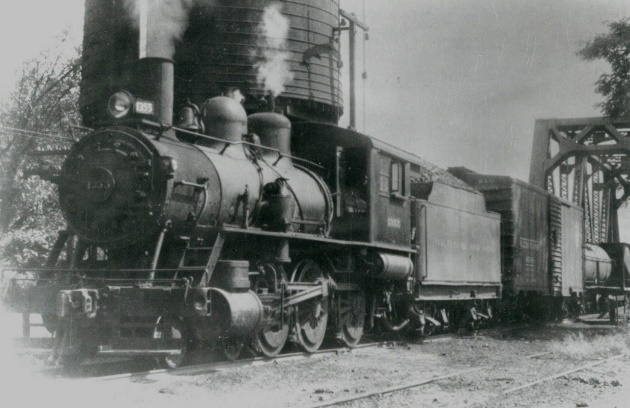 Depending on the tonnage, a helper locomotive was added as needed to traverse the three grades on the RS&G. 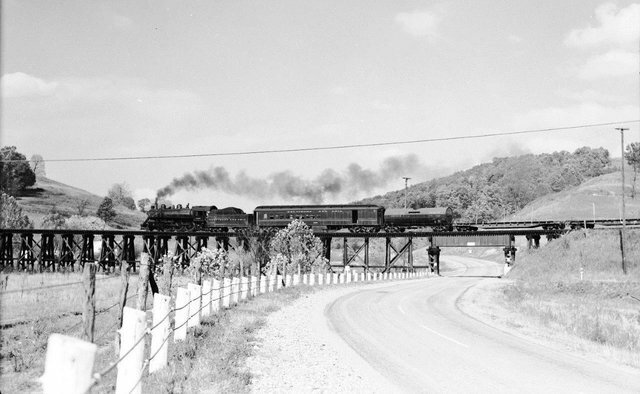 In this 1952 scene, another 4-6-0 pushes on the rear of Train #457 as it climbs the hill at Barrs trestle. Once this third grade on the route is topped, it will be a downgrade drift into Spencer (This is the rear of the same train that appears on the header photo). Richard J. Cook photo/courtesy Allen County Museum All rights reserved. 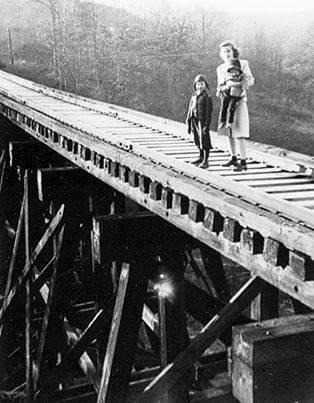 An unidentified mother and children pose for a photo standing atop Barrs trestle. A unique but certainly unsafe act for a portrait. Judging by the hair style and attire of the mother, this photo appears to be circa 1940s. Image Roane County Public Library. The region between Barrs and Nancy Run was downgrade in a narrow valley paralleling the small stream. 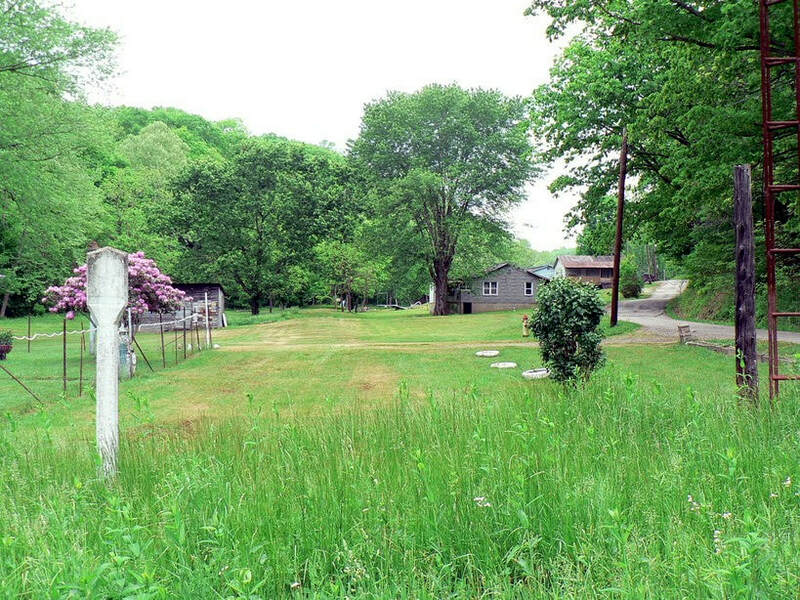 Populated by homes scattered along the right of way, this area also lists two active B&O customers as of 1948. The Virginia Gasoline & Oil Company and the Standard Oil Company both operated small facilities served by rail between Nancy Run and Spencer. Each was served by a short independent siding. The atmosphere of the railroad still exists here as the roadbed is easily traced and the presence of a whistle post adds further allure. 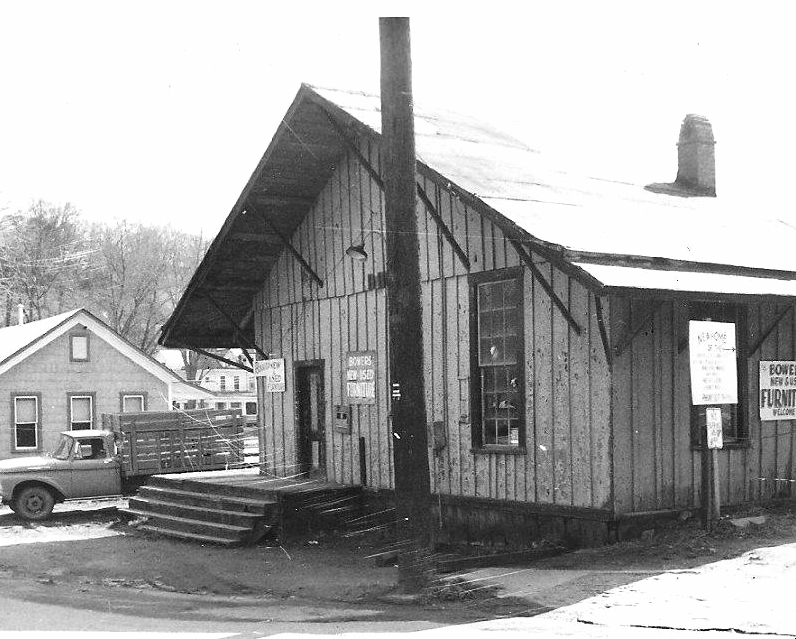 History records that a small store existed at Nancy Run which served as the whistle stop for passengers here. At the base of Nancy Run, the stream empties into Spring Creek and it is here the railroad turned south, crossed present day Route 9, and then paralleled it on a series of curves into Spencer. 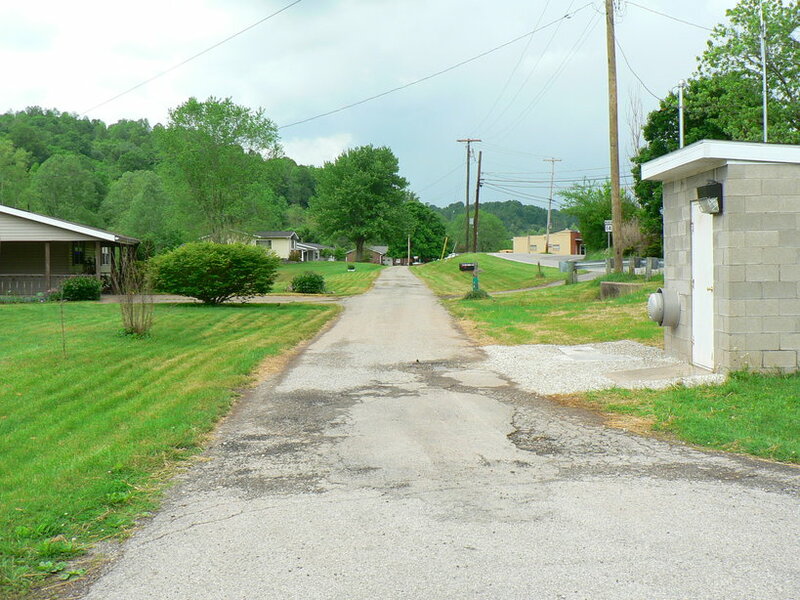 Located along this stretch were two sidings that served three shippers: Eureka Pipeline Company, Spencer Brick Company, and the West Virginia State Road Commission. Stockyard at Spencer circa 1930. Livestock was a major business for the railroad through the Depression era. Note the gondola cars in background for other Spencer shippers. Image Roane County Public Library. The B&O Class B8 4-6-0 Ten Wheelers were near the end of their careers when this 1949 photograph was taken. With fires banked, the #1352 and #1365 layover at the Spencer depot. 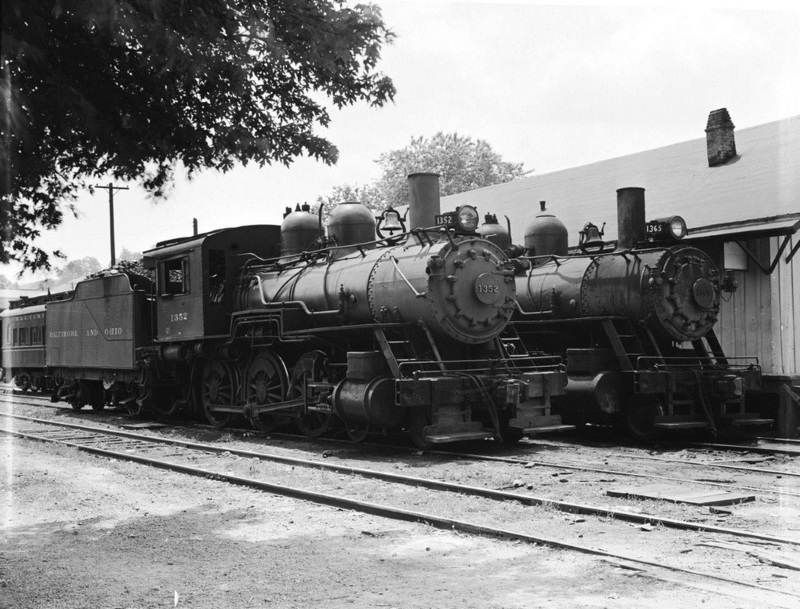 Both of these locomotives were off the roster by 1951. Richard J. Cook photo/courtesy Allen County Museum All rights reserved. 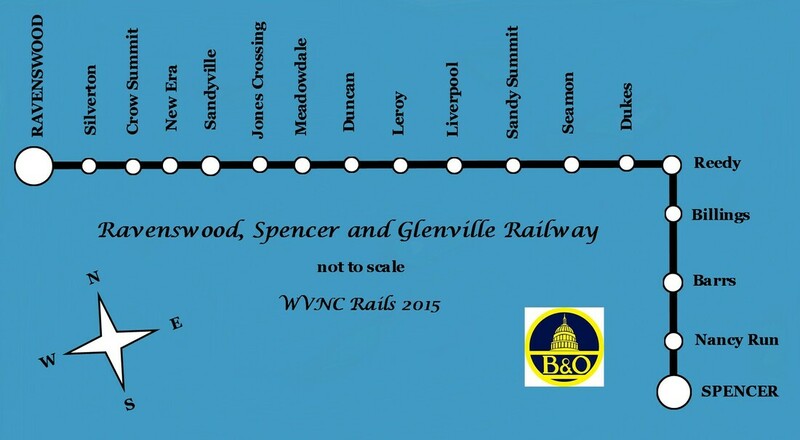 Spencer, the seat of Roane County, was projected as a mid-point along the Ravenswood, Spencer, and Glenville Railway but became the terminus by default. As the railroad was constructed no further to the planned destinations of Glenville and Weston, the RS&G and later B&O maintained runaround tracks and a turntable to prepare trains for the return to Ravenswood. Spencer was an outpost located at the end of a 32.7 mile branch but personified a small railroad town true to character. B&O 4-6-0 #2026---in color with the fireman in the cab. 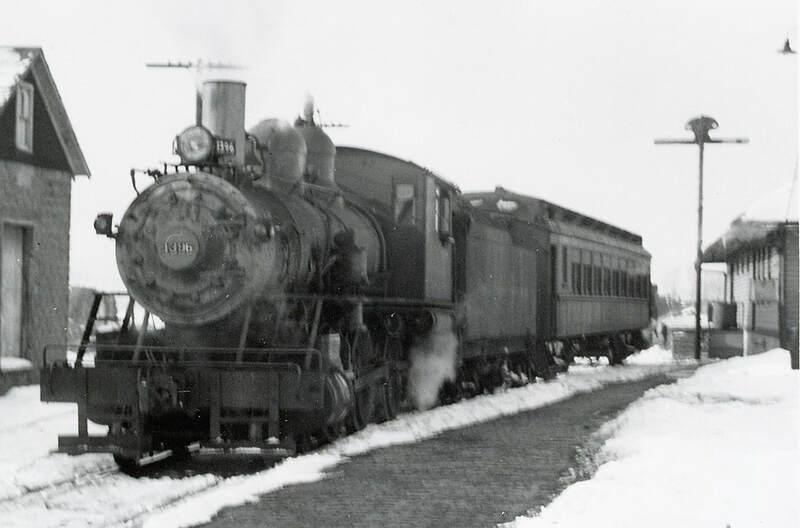 This locomotive was a frequent visitor to Spencer during the early 1950s. Image Gordon Depew/Scott Greathouse collection. 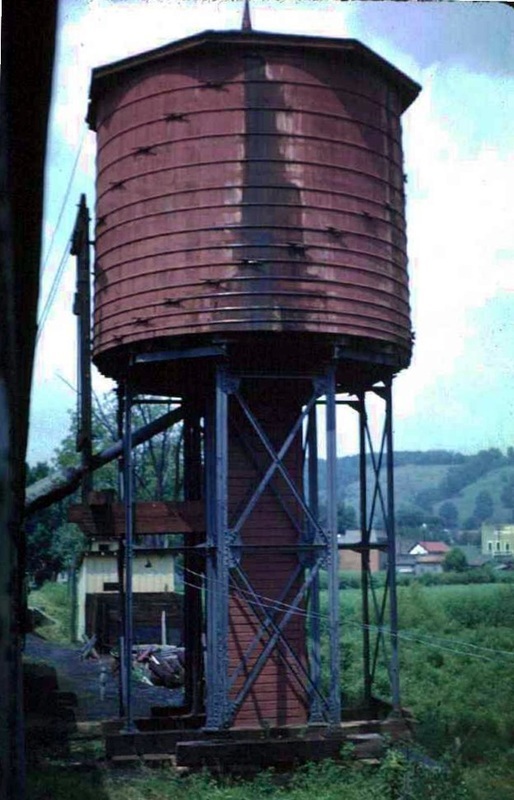 As late as 1948, B&O still maintained coal, water ,and livestock watering facilities at Spencer and remained a train order station. The turntable was located directly to the rear of the depot. 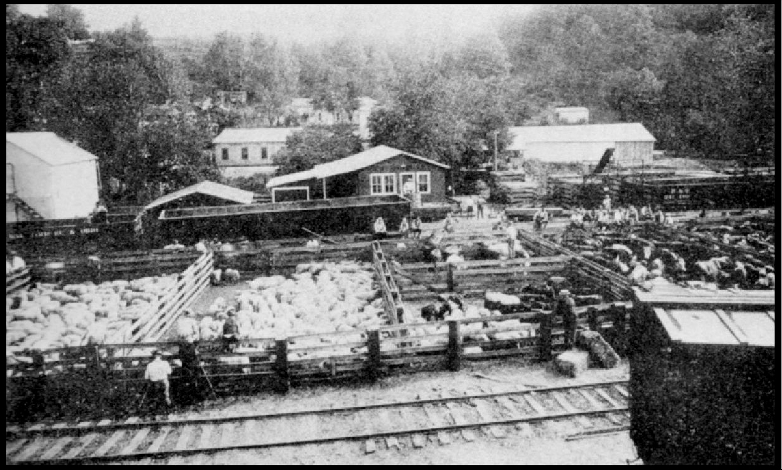 Vital to the commerce of both the region and railroad, the town was a long established regional livestock center. This business was generally seasonal and extra livestock trains were added as necessary to supplement the scheduled trains. Complementing the livestock shipping, Spencer was a regional hub for the oil and gas industry for numerous firms related to the business that populated the region. B&O tapped into this business albeit on a relatively small scale with the majority of its shippers at Spencer in this field. Shippers related to agriculture--prominent in the region---were also served by rail. Directly at Spencer, the 1948 B&O register listed the South Penn Oil Company, Hope Natural Gas Company and the J.N Jackson Company. Beyond the depot and at the end of the line was located the Farmers Roller Mills. Without question Spencer accounted for the highest percentage of passenger ridership in the history of the RS&G. As both the terminus and largest population center on the route, it was the gateway connection to and from the outside world by rail via Ravenswood. Intra branch line traffic to and from other points along the line was also common as a means to visit family and conduct business. The large mental hospital located at Spencer throughout the history of the line accounted for travel in medically related concerns. The pattern of passenger volume on the RS&G mirrored branch line traffic across the United States although one exception is that it remained longer than most. The early years of the railroad into the World War I was the zenith. By the 1920s, better roads and increased numbers of automobiles began to reduce patronage on the rails at Spencer and along the route as a whole. This trend continued downward with the passing years with a brief spike during the World War II period. So much had the passenger base eroded by the 1950s that only a handful of passengers remained riding the trains on any given day. What if to Glenville or Weston? The late 1800s was a period of tremendous expansion for American railroads. Ambitious businessmen harnessed dreams of constructing a railroad from an origin to a predetermined terminus and these plans were often reflected in the chartered name of the line to be built. Once under construction, reality eventually ruled the day with gross under estimations of costs and capital required to build the railroad in its proposed entirety. Examples abound of lines only partially constructed but the modification was never changed in the charter name. Such is the case with the Ravenswood, Spencer, and Glenville Railroad that would eventually be absorbed into the Baltimore and Ohio Railroad network. 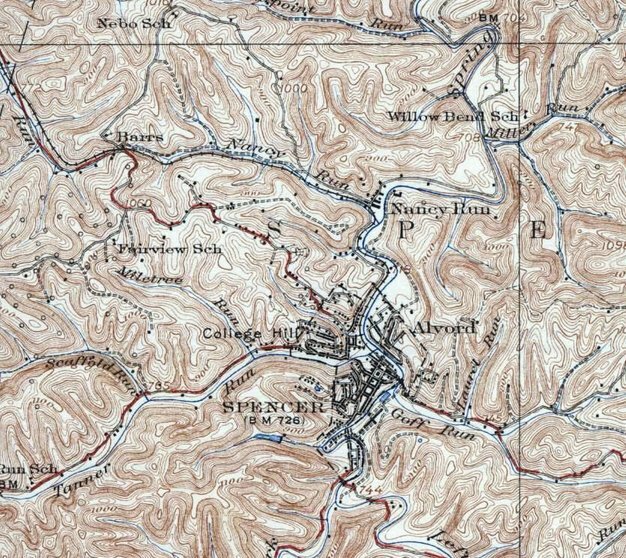 If one studies a topographic map of the region between Spencer and Glenville, perhaps the easiest route for construction to Glenville was following Spring Creek north from Spencer to its confluence with the Little Kanawha River in Wirt County. From here, it could have followed the river east through Calhoun County passing through Grantsville continuing through Gilmer County into Glenville. But this would have been an expensive---and prohibitive----task reinforcing why the route never extended to Glenville. Construction along the Spring Creek-Little Kanawha drainage---or any alternative---would have required extensive trestles over cuts and perhaps tunnel drilling to achieve the goal. It is interesting to speculate what may have occurred had the line been built to its intended destinations of Glenville and Weston. The construction of the RS&G predated the building of the Coal and Coke Railway in the Elk River valley by several years. 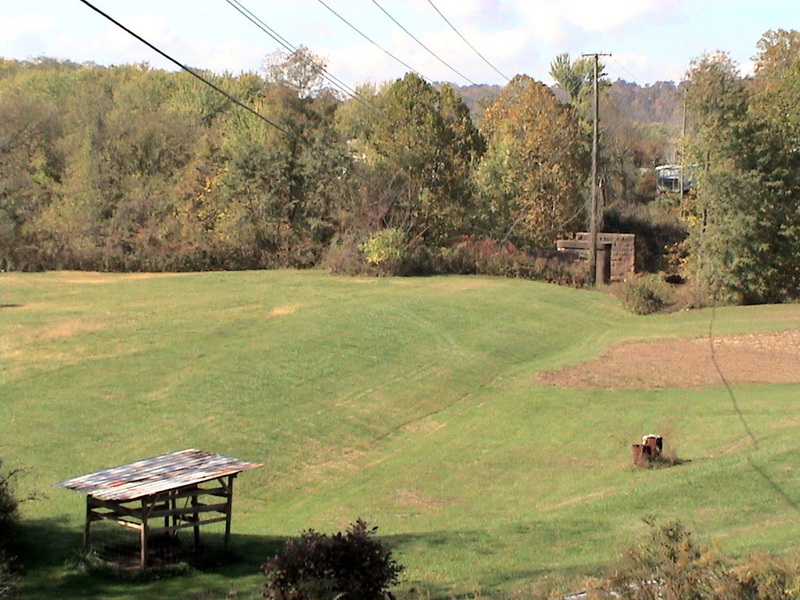 When the Coal and Coke Railway was built, an extension was added from the Coal and Coke at Gilmer ending within 5 miles of Glenville. Had the RS&G been constructed in its entirety through Glenville, there is little question that a connection would have been established between it and the Coal and Coke Railway. This would have created a route---albeit slow and circuitous---directly between the Elk and Ohio Rivers bypassing passenger travel through Grafton, Clarksburg, or Charleston. 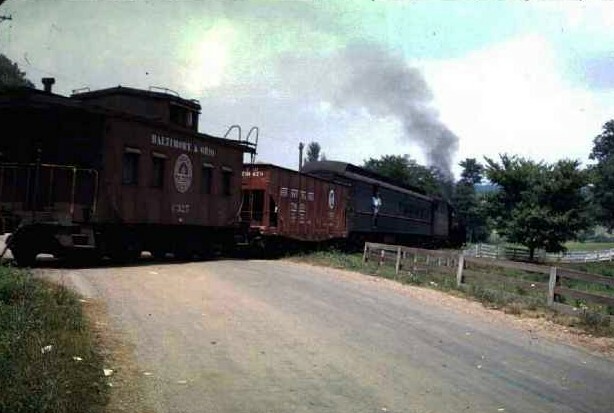 A route stretching to Weston would have created additional possibilities for a cross central railroad with a connection to the West Virginia & Pittsburgh Railroad (B&O). In regards to freight, the RS&G would have experienced an increase with commodities of oil, coal, and possibly timber. Ultimately, additional routes for the B&O in central West Virginia could have been created had this all been realized. During the 1980s, I spent considerable time in the region the RS&G traversed while on the job. Frequent service work at Ravenswood, Spencer, and the treks across Liverpool Road to various locales enabled me to trace right of way of this railroad during different seasons. Thirty years ago, it was more defined and during winter months clearly distinct throughout its course. In hindsight, I regret not taking photographs if not but a few to document what was. It would be another twenty years before I would return to the region in 2005 and did take a few photos of which appear on this page. The recent May 2015 visit was more reflective in tone. The thought was about how much time has passed since I regularly traveled this area and the changes---although subtle---that have transpired. An overwhelming thought when in this area---especially along serene Liverpool Road----is contrasting the rapid paced society of today. It now seems inconceivable that a railroad passed through here and remained until the late 1960s. Railroads are generally most focused with urban reaches and to ponder that the Baltimore and Ohio Railroad in its fabled history operated trains through here defies logic. But operate them it did providing a valuable pipeline for passengers and goods alike through territory where travel was difficult at best. Understanding history and contrasting it with the comparatively sterile railroad landscape of today presents a curious dichotomy between yesterday and today. The RS&G and other branch lines similar in character summarize an earlier time reflective of a slower pace when people and machines were on even keel. Sadly, that balance has tipped disproportionately in favor of machines---perhaps technology is the more appropriate term today--that leaves an impersonal stamp on daily life. 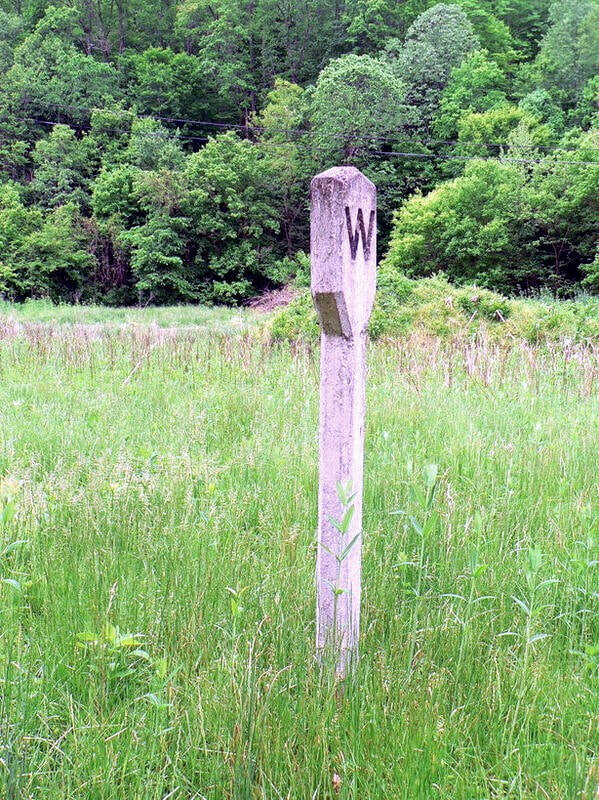 With each passing year lost are more people who had a direct connection to this railroad and the eroding of the right of way continues. Eventually, both will be gone entirely. For those reasons alone, an incentive to preserve its history even at a humble level such as this. As a final thought, what a leisurely train ride this would have been. A slow trek, indeed, but quite an enjoyable trip through the countryside of Jackson and Roane Counties and especially so during the autumn. And yes, one of those 4-6-0 Ten-Wheelers with the staccato of its smokestack and shrill of its whistle echoing through the valleys leading the way. 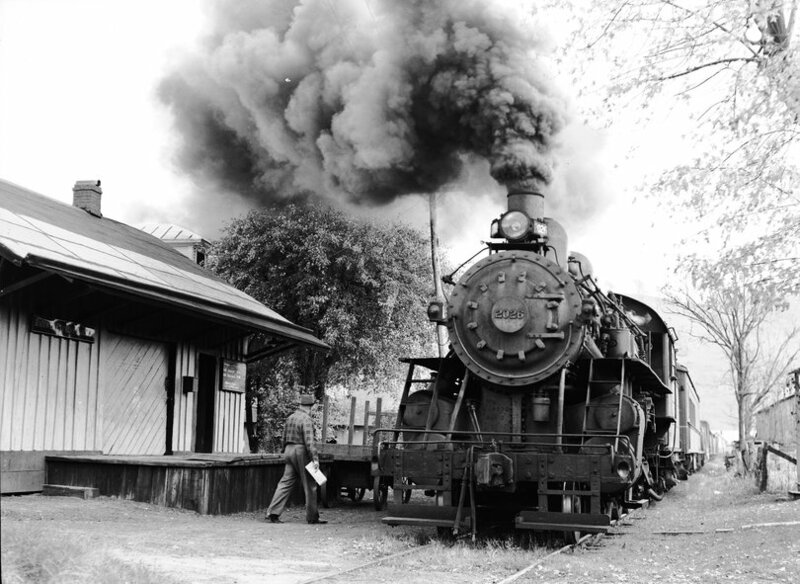 This page is dedicated to the fine people of Jackson and Roane Counties and to the memory of Richard J. Cook who with his camera preserved glimpses of this railroad for posterity.